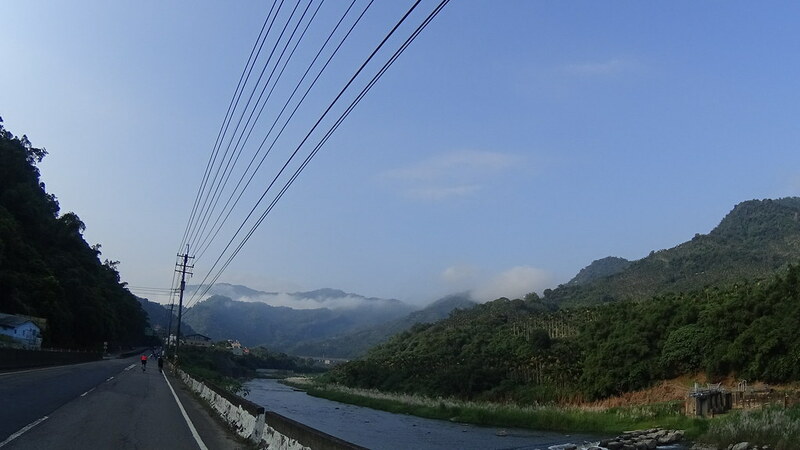 Starting Location: Zhongxing New Village, Nantou (中興新村,南投). 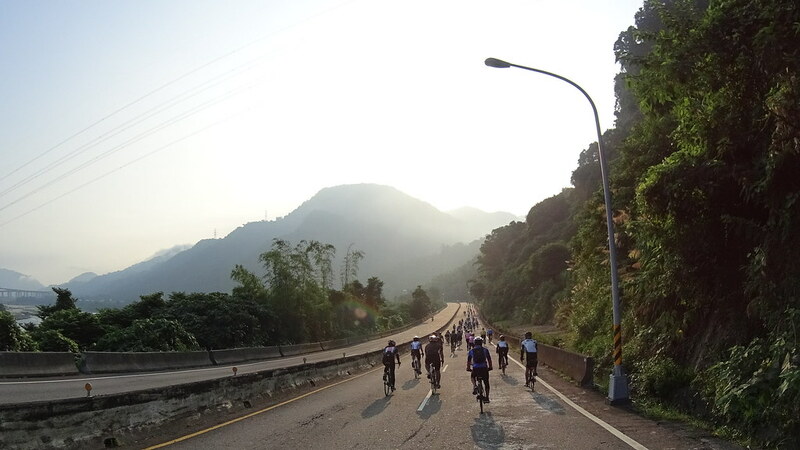 Length: 115km. 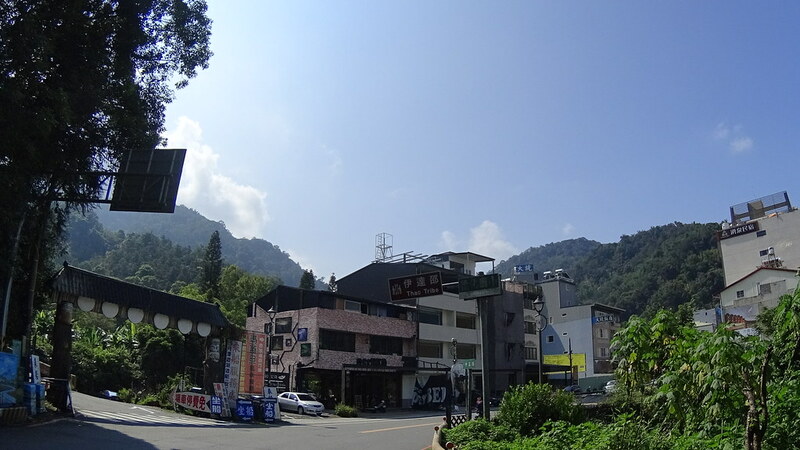 Highest elevation: about 920m. 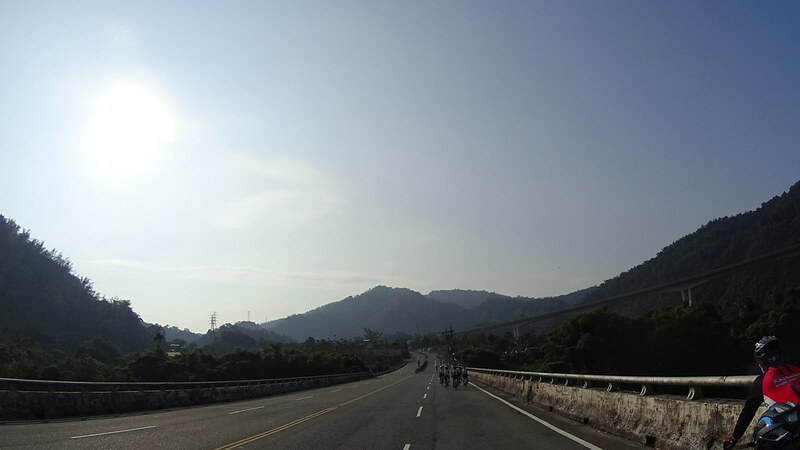 Hill profile: Long, mild hill climb. 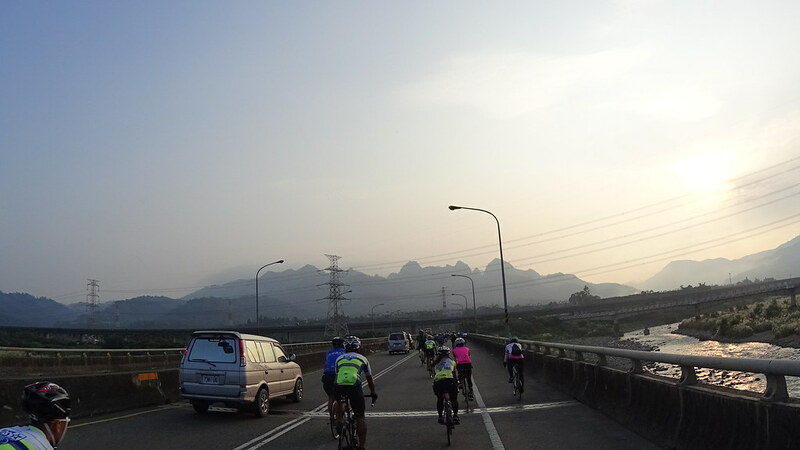 More traffic at Puli (埔里). 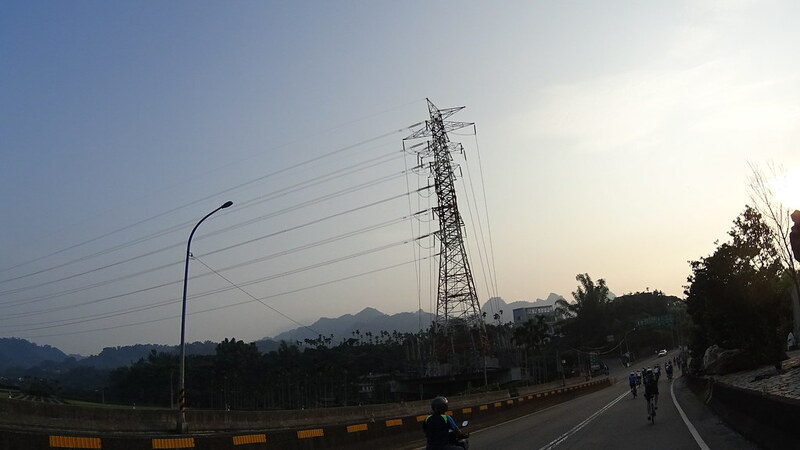 Traffic controls at major intersections. 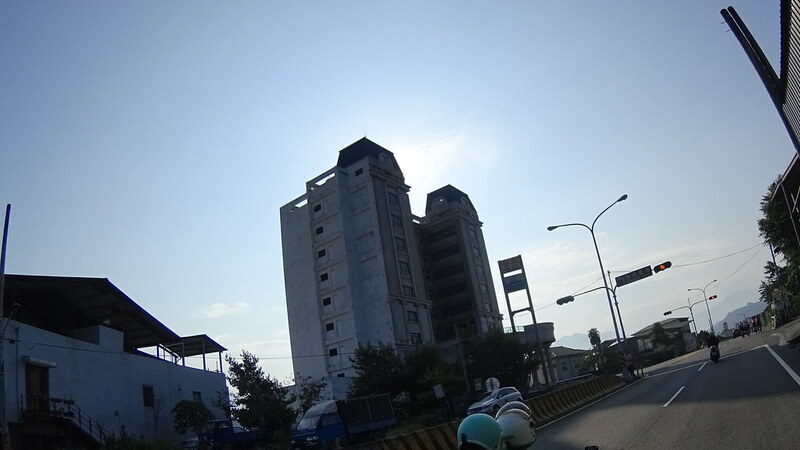 Good for: Building your base. 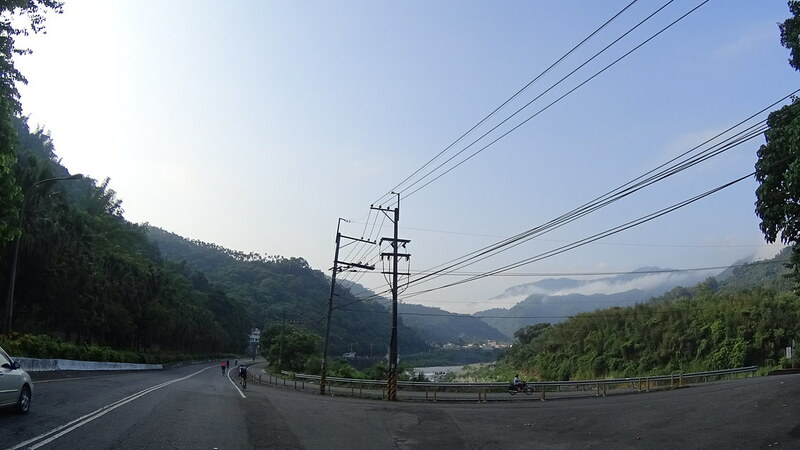 River valley scenery (Route #14). 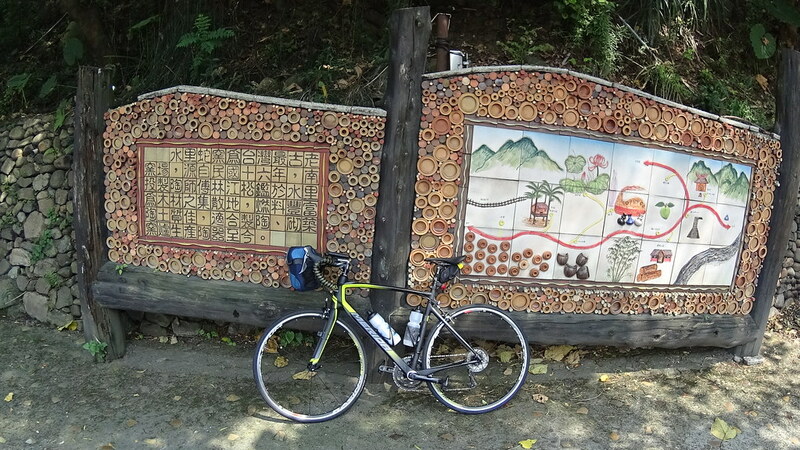 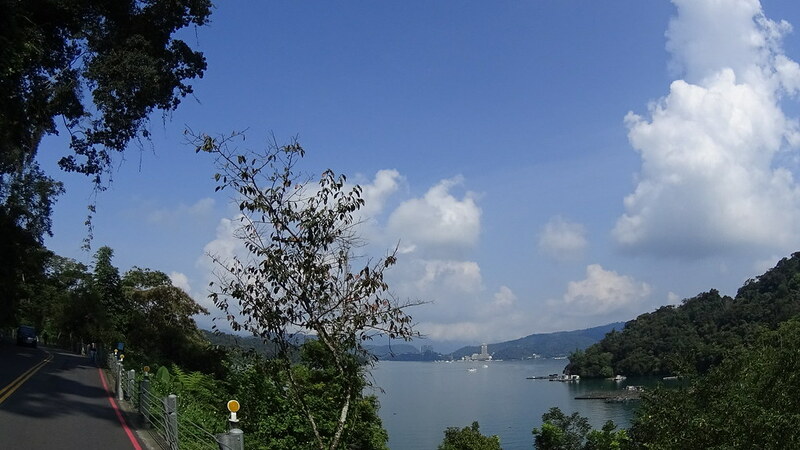 For a very long time I stay away from cycling to Sun Moon Lake (日月潭) due to its over-development (thanks to short-sighted Taiwan Tourism Bureau promoting high-volume, low-quality tours) and presence of too many big tourist buses. 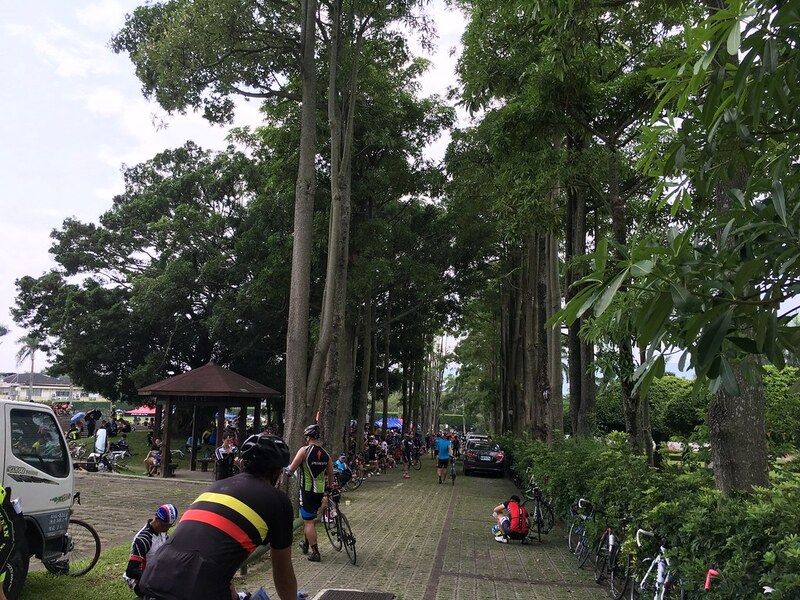 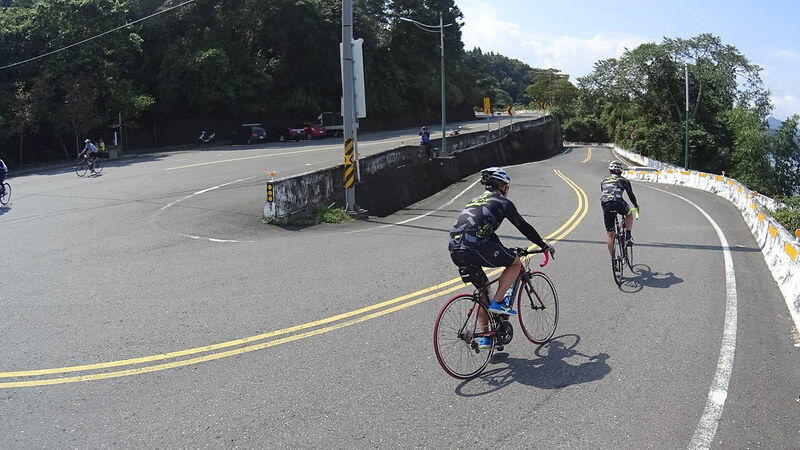 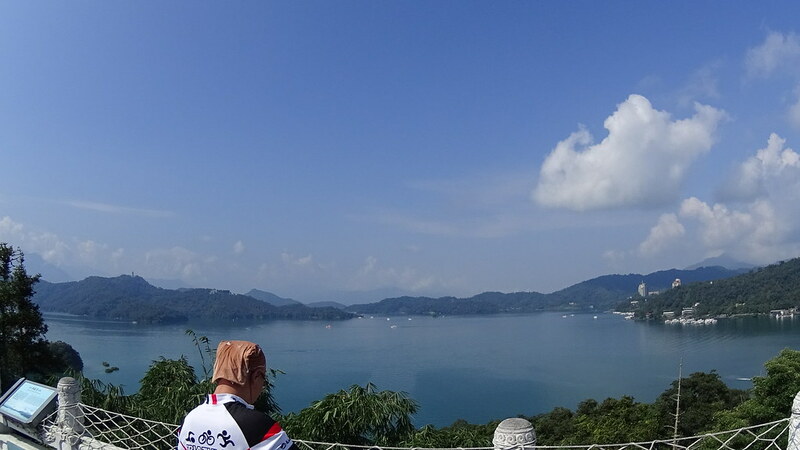 Now the foreign visitors have decided to stay away from going to tourist traps like Sun Moon Lake, I think it’s time for me to join many other cyclists and reclaim our nature for good use. 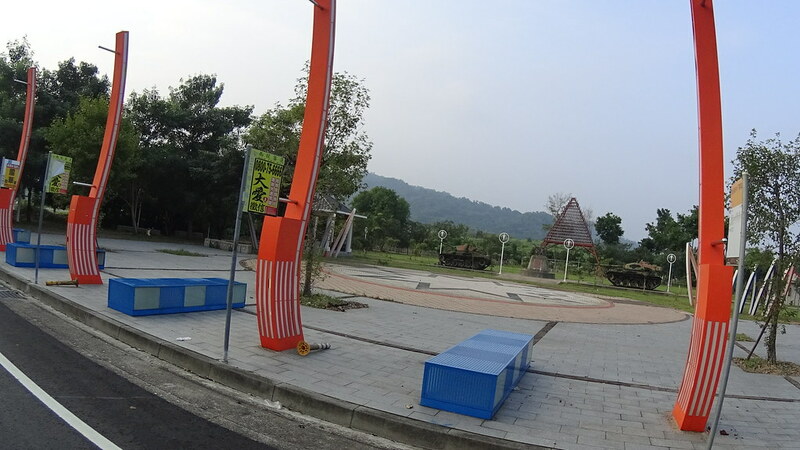 We have a pretty big army gathered at Zhongxing New Village (中興新村), a popular place in Nantou for park activities. 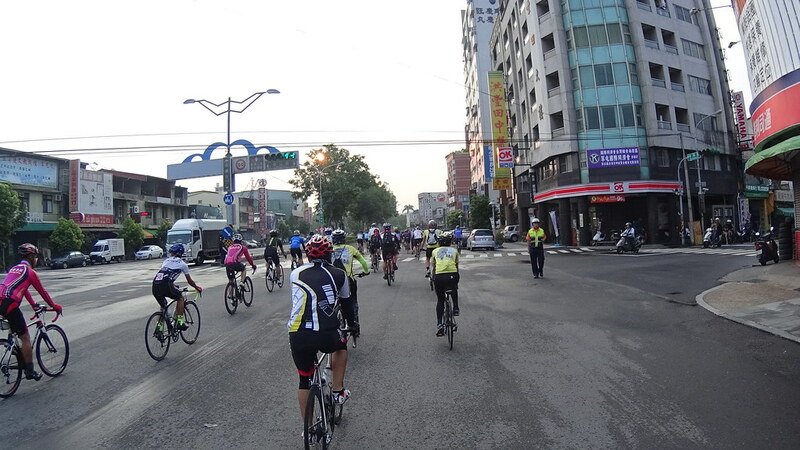 Going through Zhongxing New Village’s iconic round about. 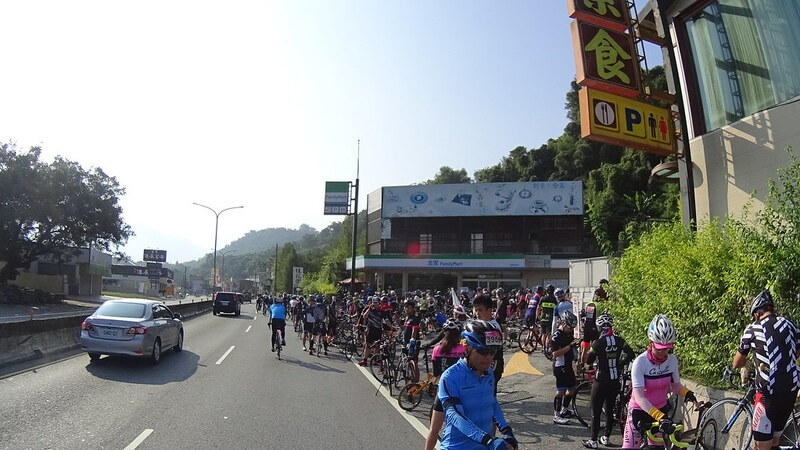 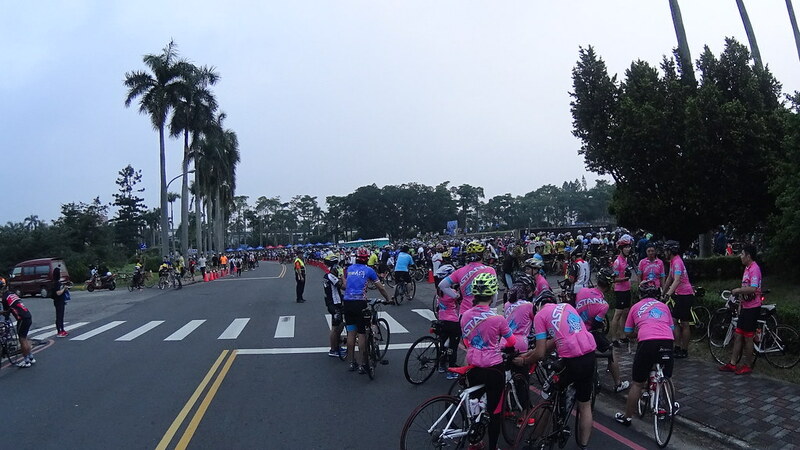 The first part of the ride goes through crowded town of Caotung (草屯). 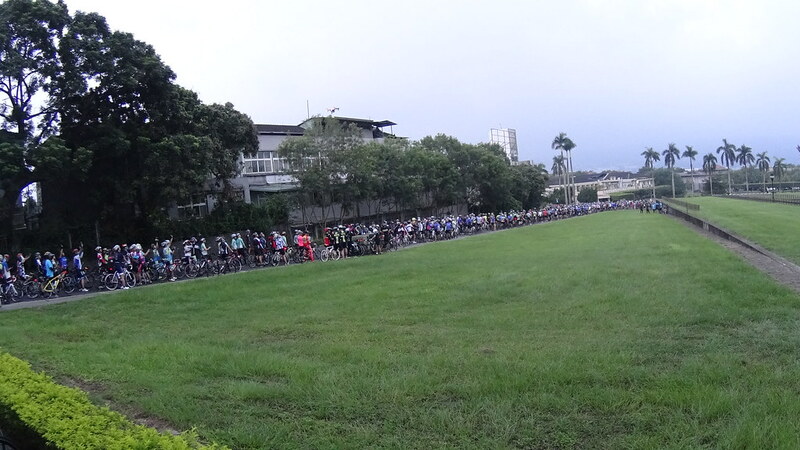 It’s morning and there is already quite some traffic. 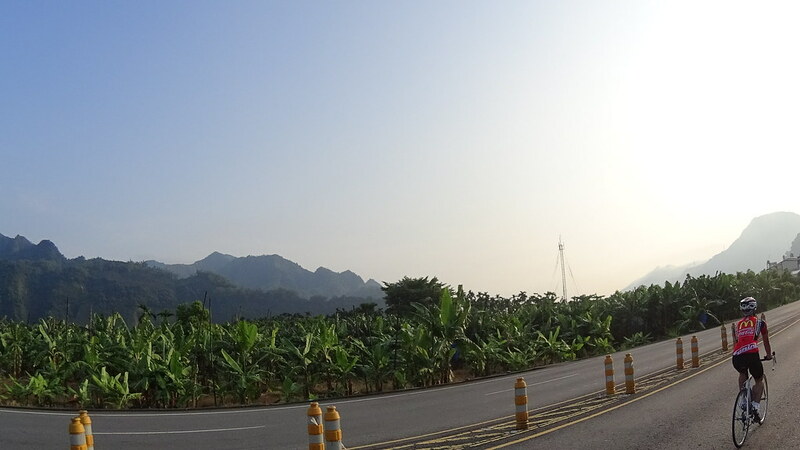 Road lined with coconut trees. 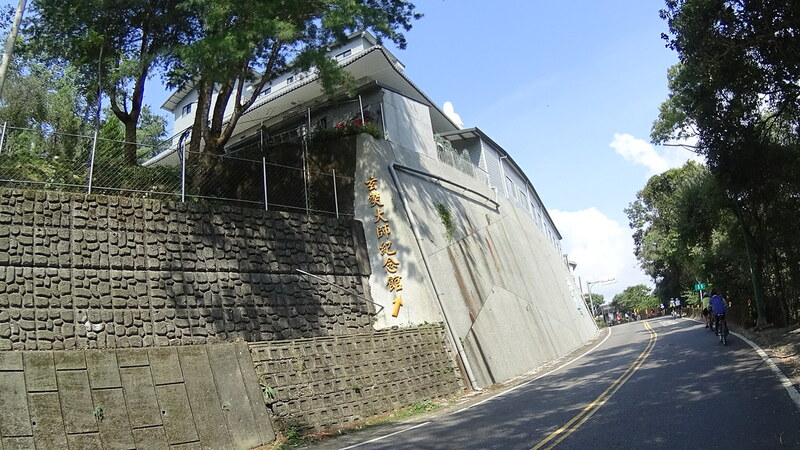 Passing Caotung’s art & performance center. 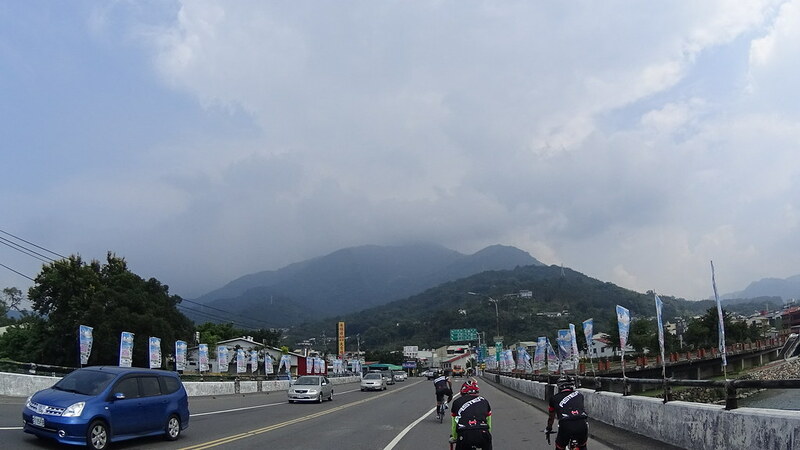 The route eventually leaves town and goes onto Route #14, the major local route that crosses the big Taiwan mountains all the way to the east shore. 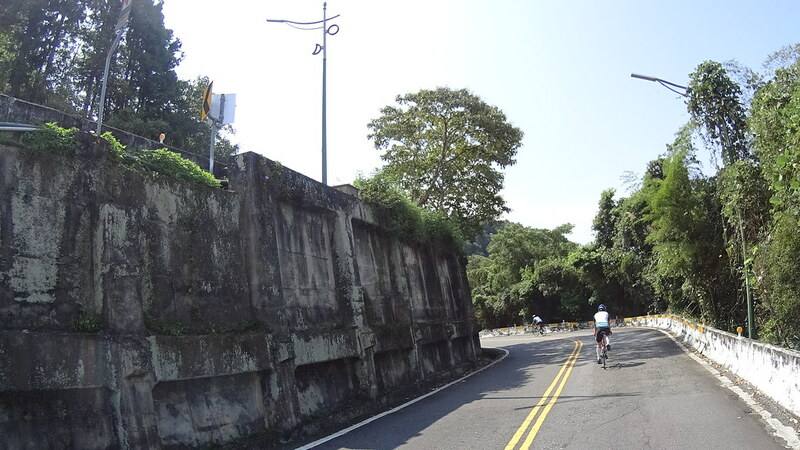 Many dump trucks used to roar on the road, but since a few years ago they are not allowed to be on the road during weekends, making route #14 safer for cyclists. 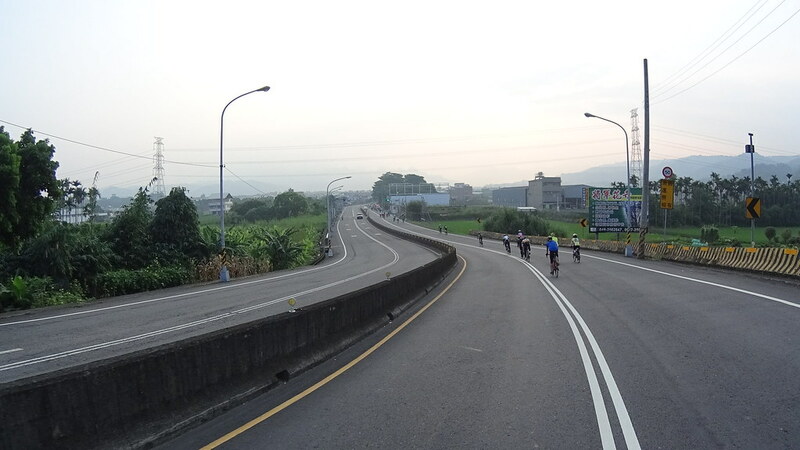 Wide, empty Route#14 on the weekend. 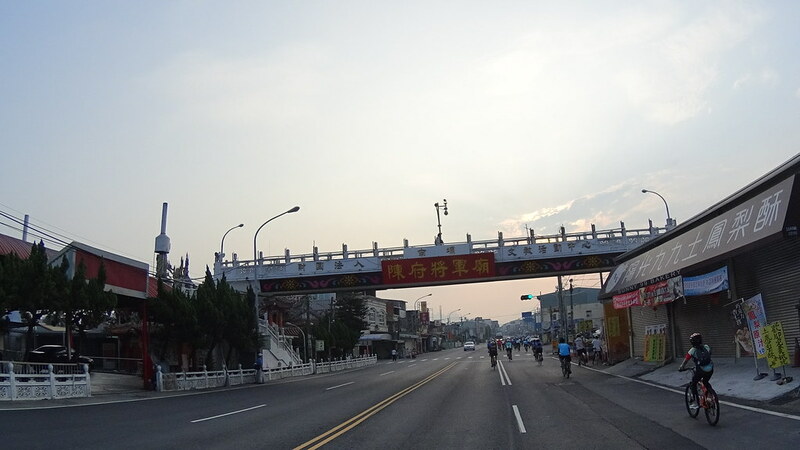 It said “General Chen Temple” on the sky bridge. 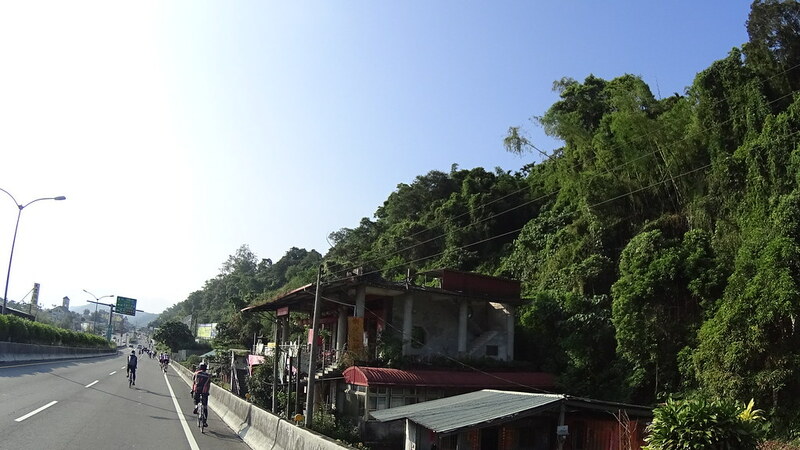 There are still some sand processing facilities along Route #14. 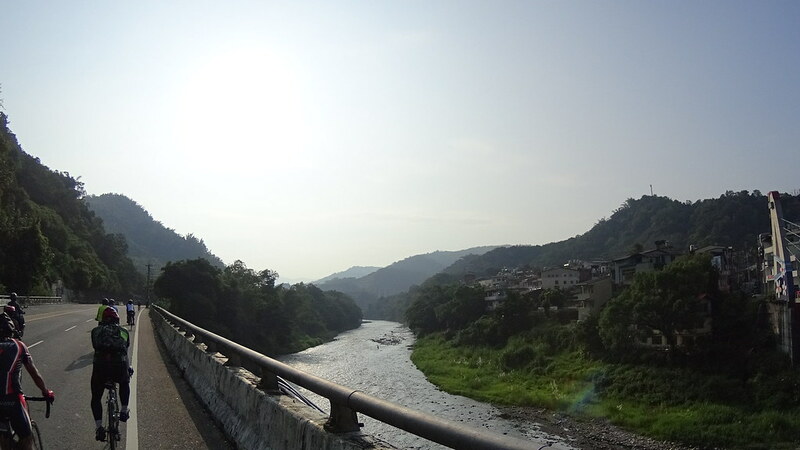 Great open river bed view. 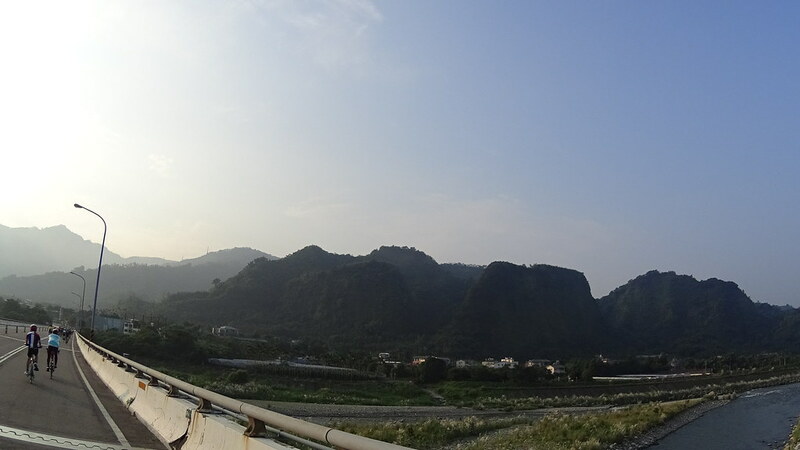 The saw-like mountains in the background is called “The Ninety-nine Peaks”. 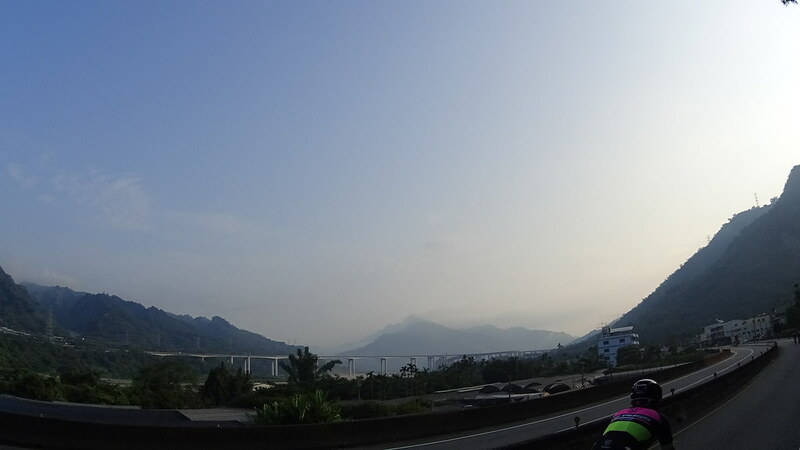 Layers and layers of mountains. 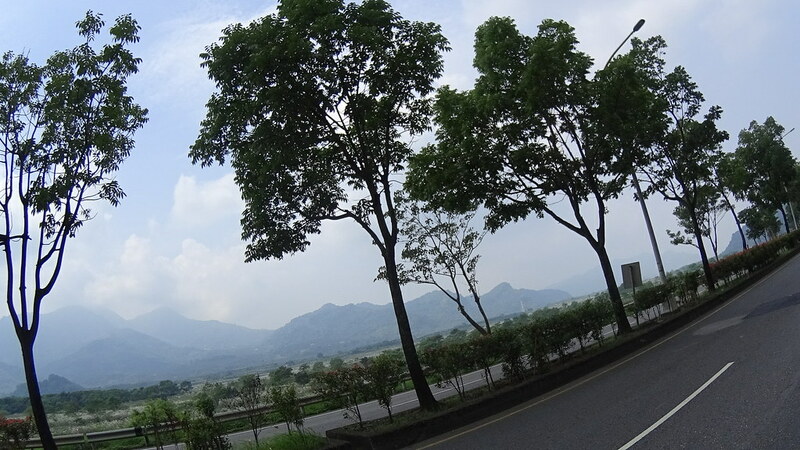 The highway in the background is State Highway #6 that goes all the way to the central Taiwan town Puli. 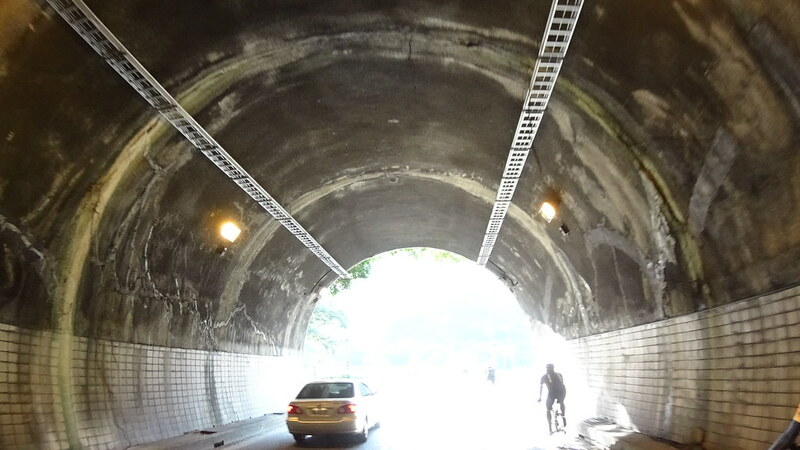 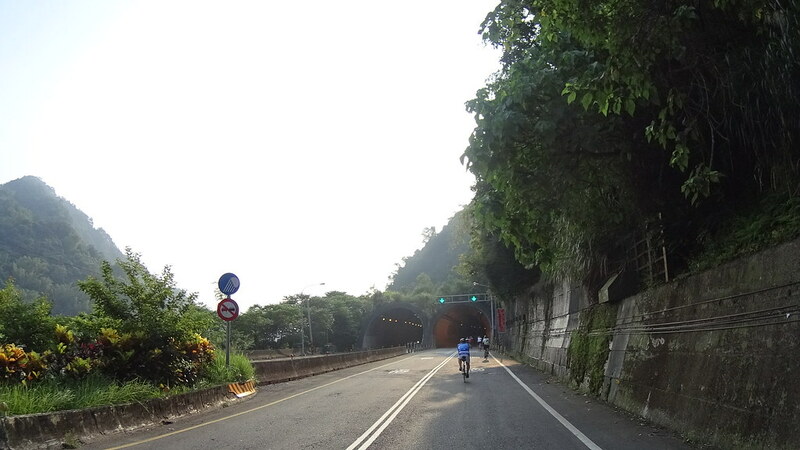 As Route #14 continues east, it goes through many tunnels in order to pass layers of mountains. 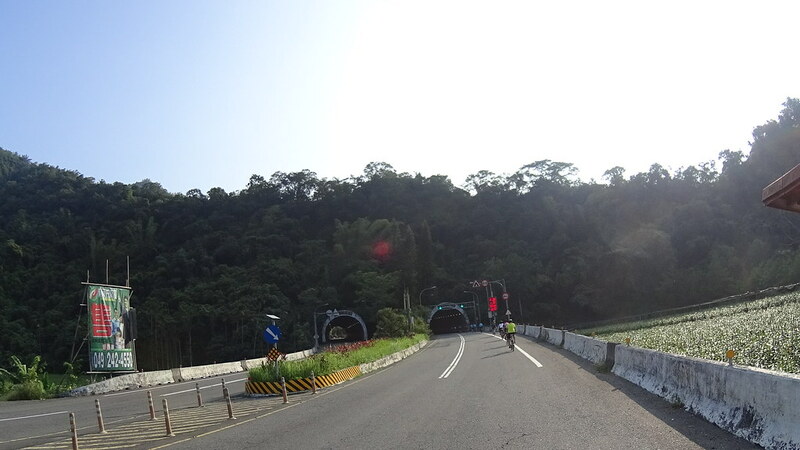 First tunnel. 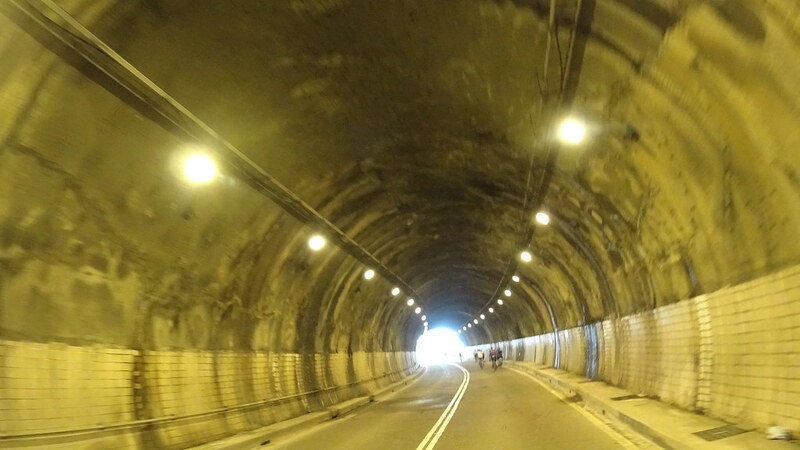 The tunnel was built only on the right side. 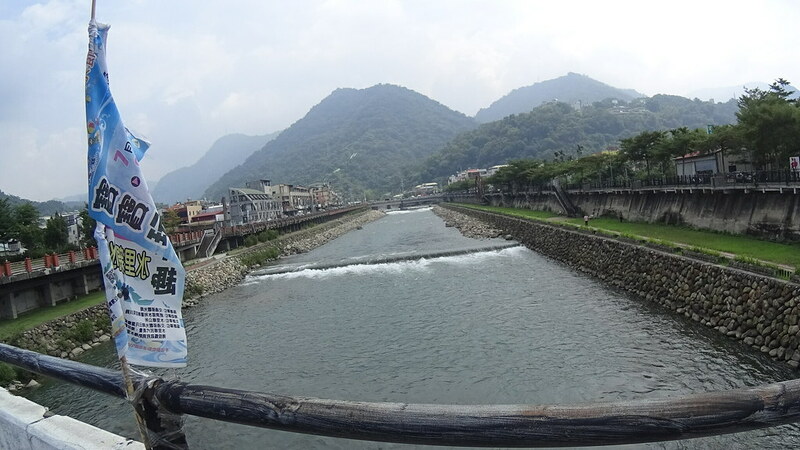 As Route #14 passes the first tunnel, the river becomes narrower and the route displays beautiful river-valley scenery like that of the Leavenworth German town in US’ Washington state. 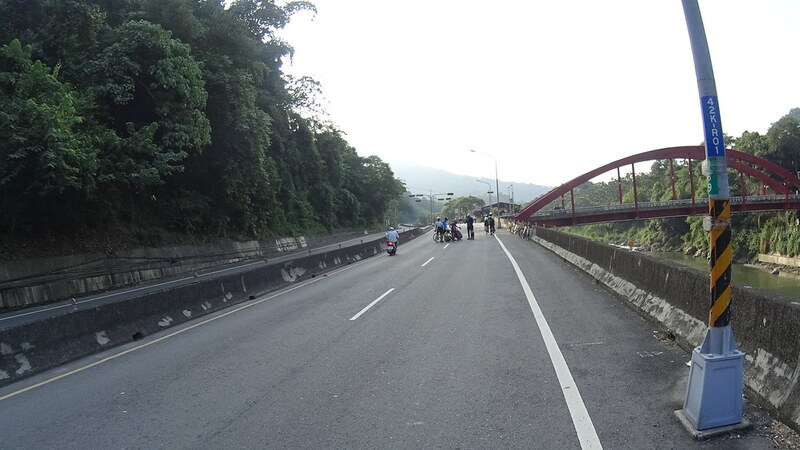 Little cyclist accident episode in the middle of the road. 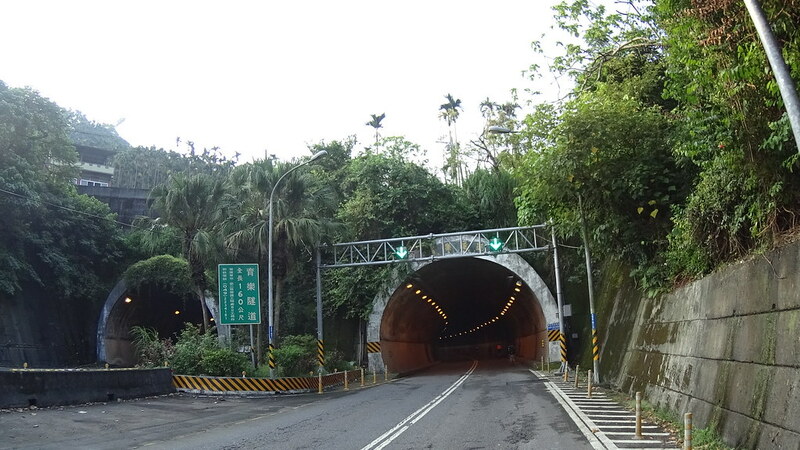 Fourth tunnel. 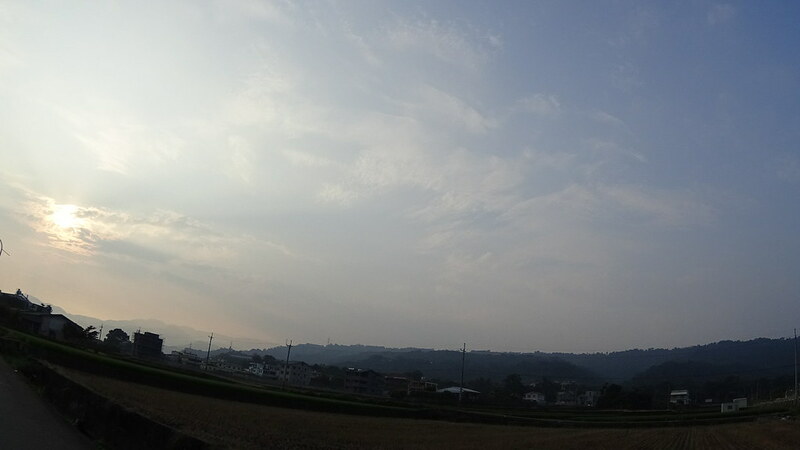 Only on the left side. 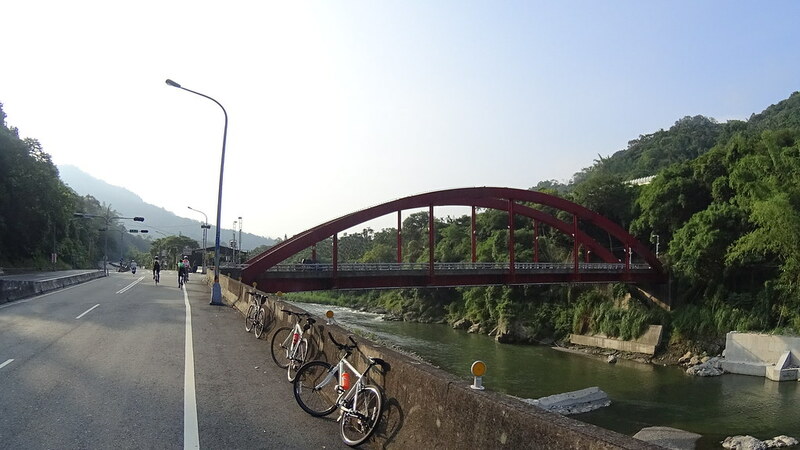 PeiShan Bridge. 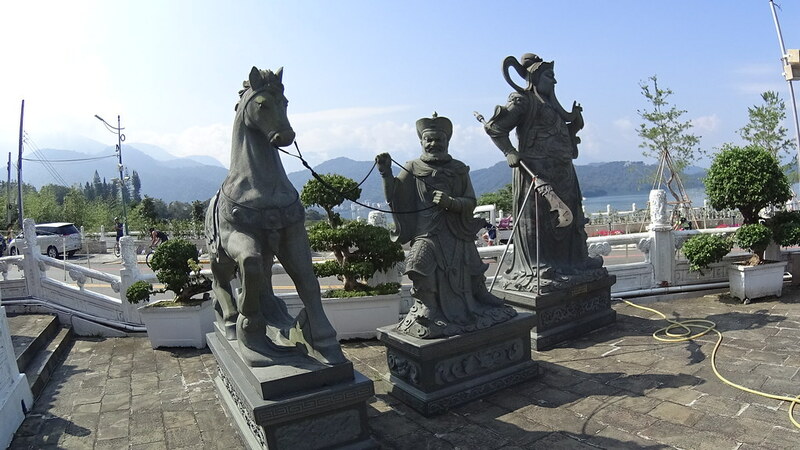 The deer statues on two side represent local’s deer farms. 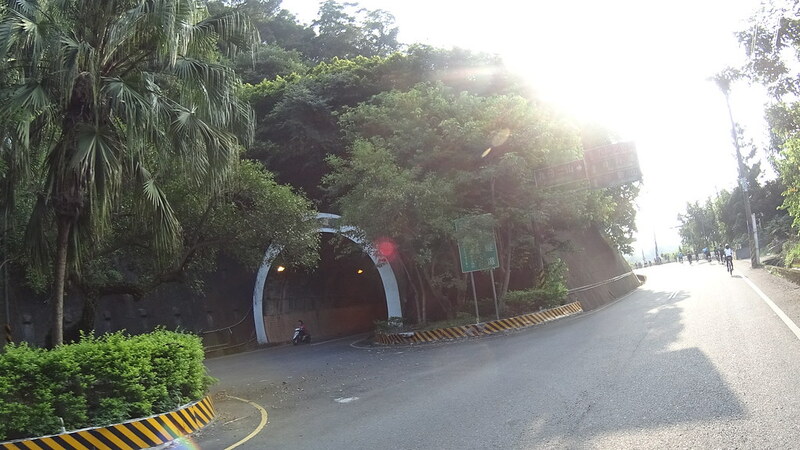 Sixth tunnel. 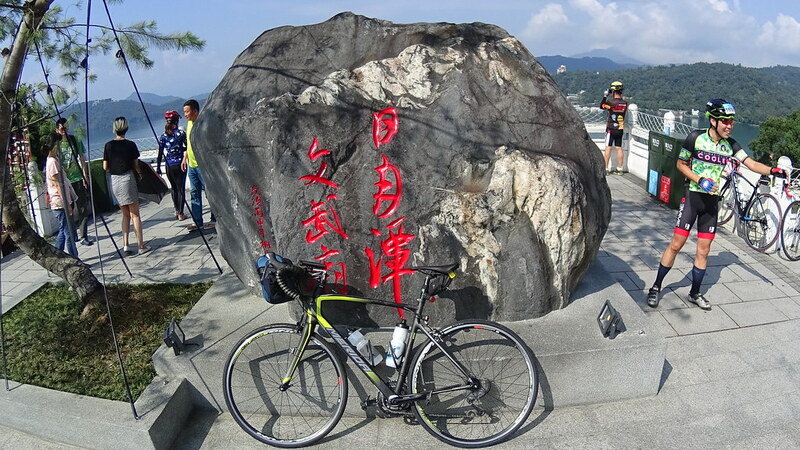 It said “Guanyin No. 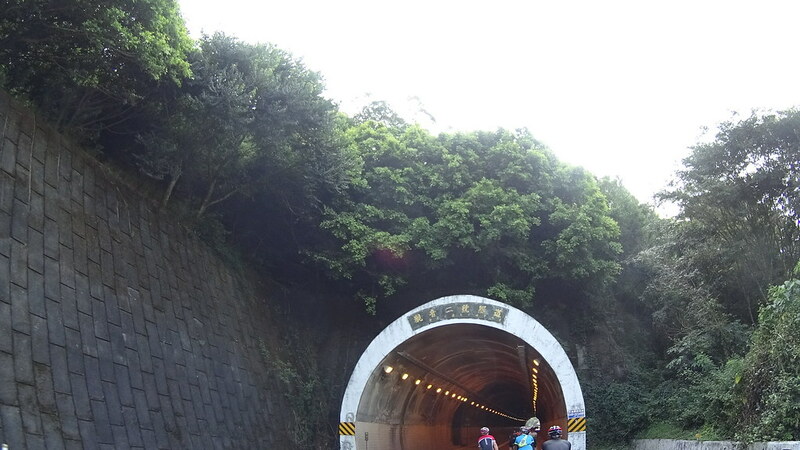 2 tunnel”. 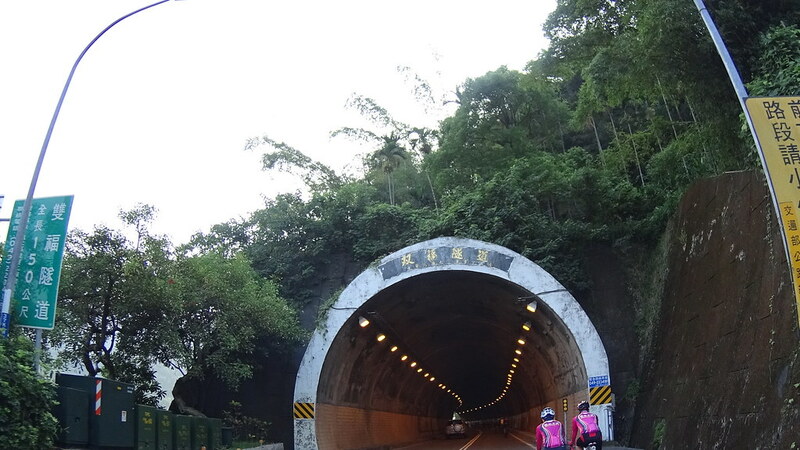 Seventh tunnel, the last tunnel on the route. 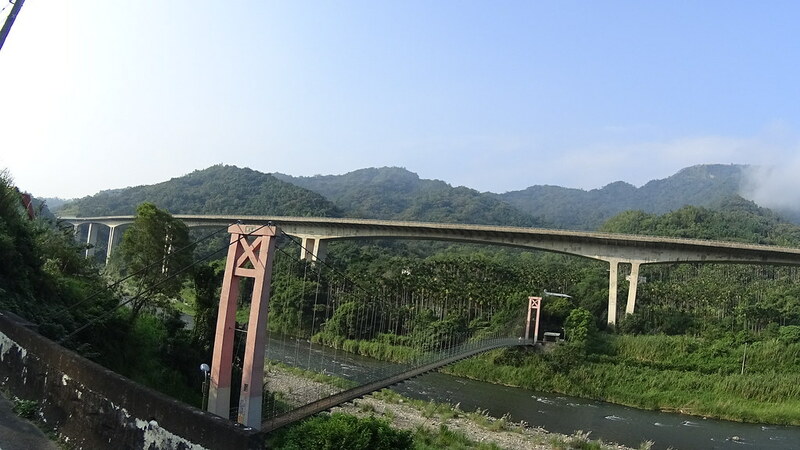 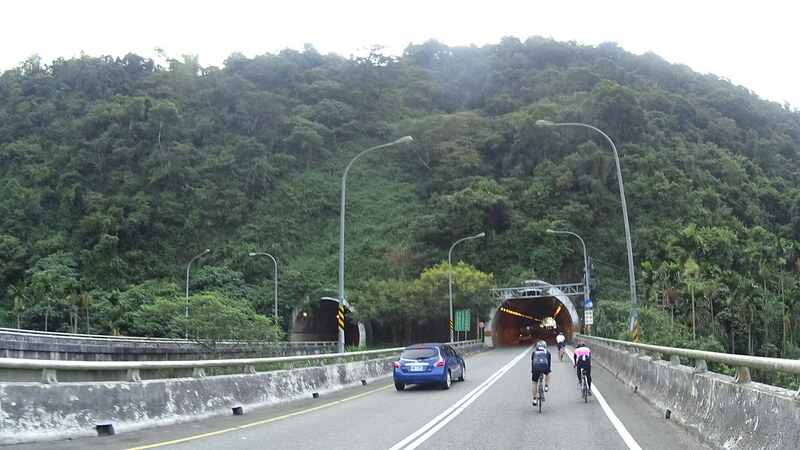 After passing 7 tunnels Route #14 enters Puli (埔里), the major town located in the basin area of central Taiwan. 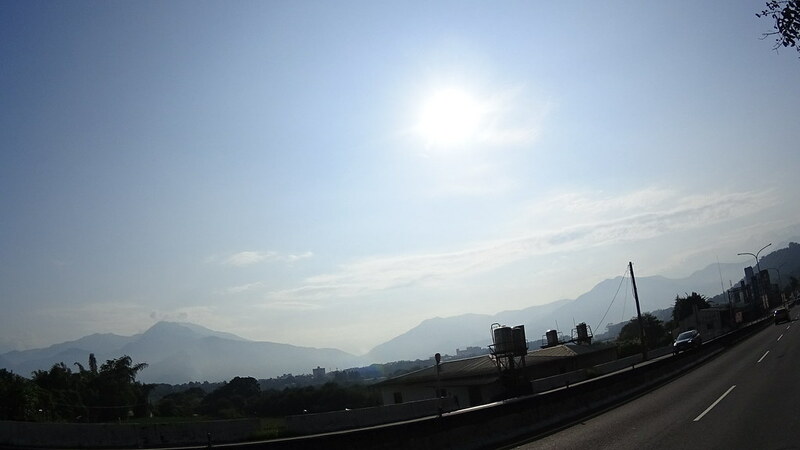 Surrounded by mountains in every directions. 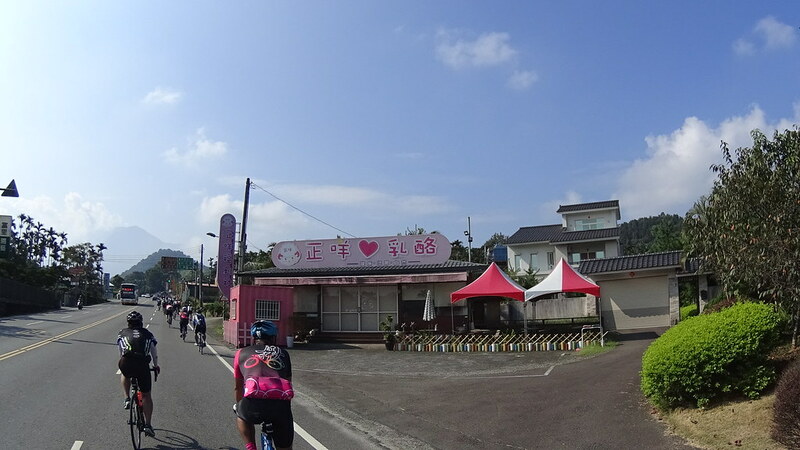 A rest stop here at the convenient store. 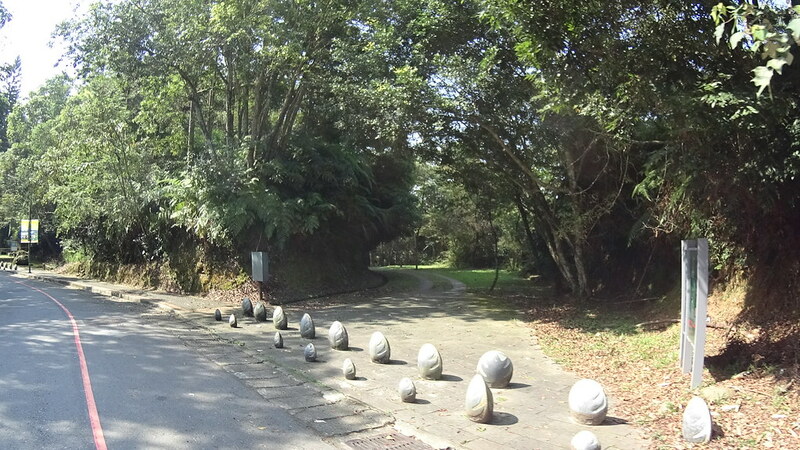 Link would gladly break all of them. 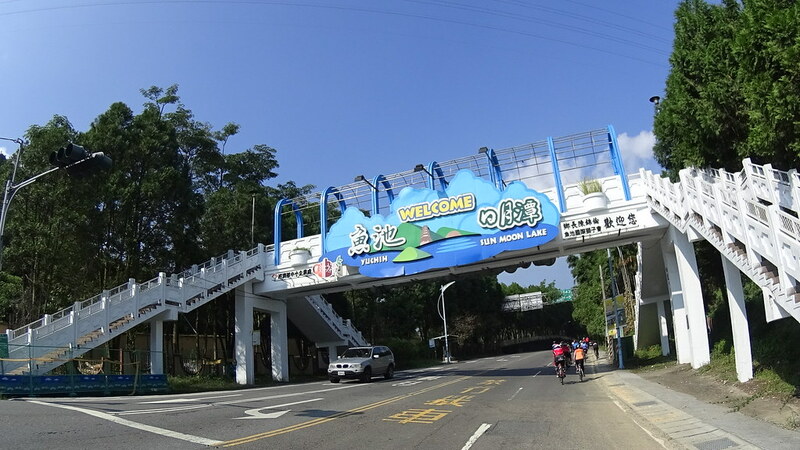 Muh Sheng Museum of Entomology sign. 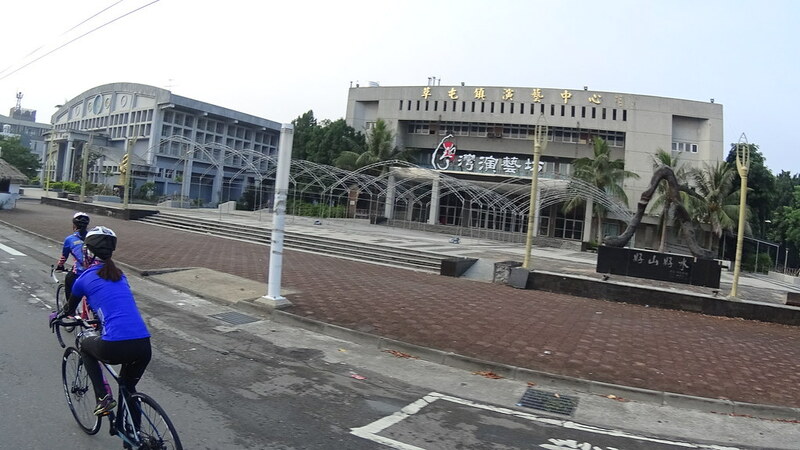 One of the oldest museums in Taiwan. 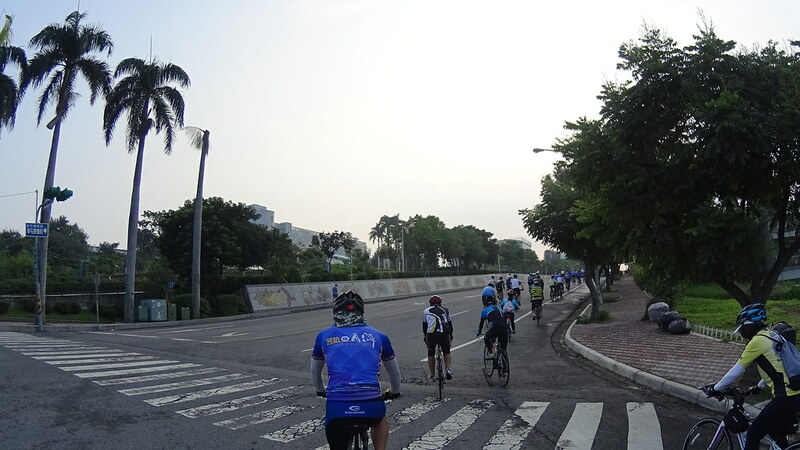 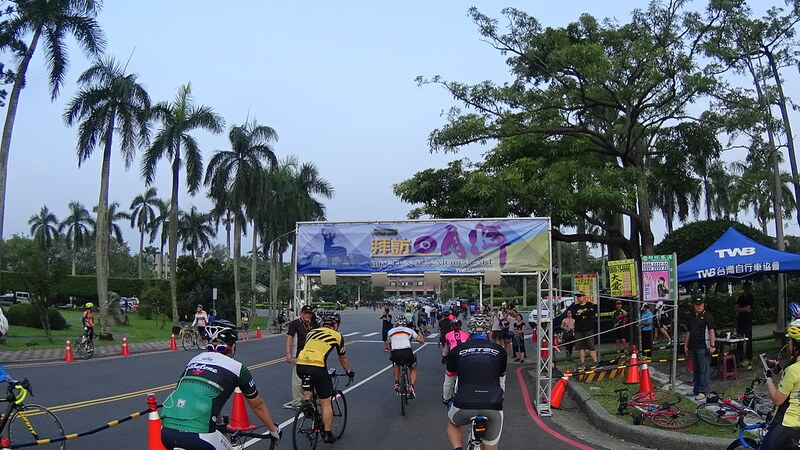 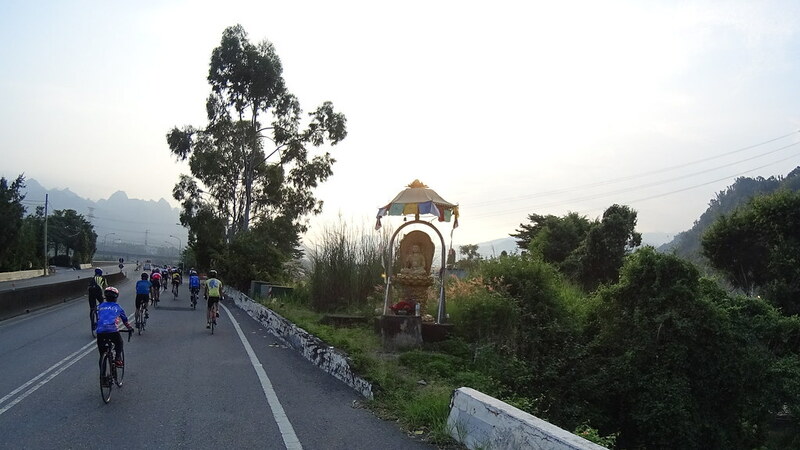 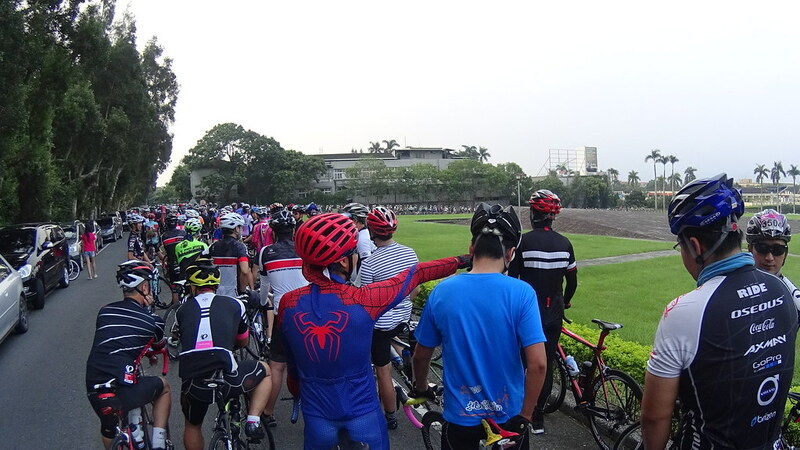 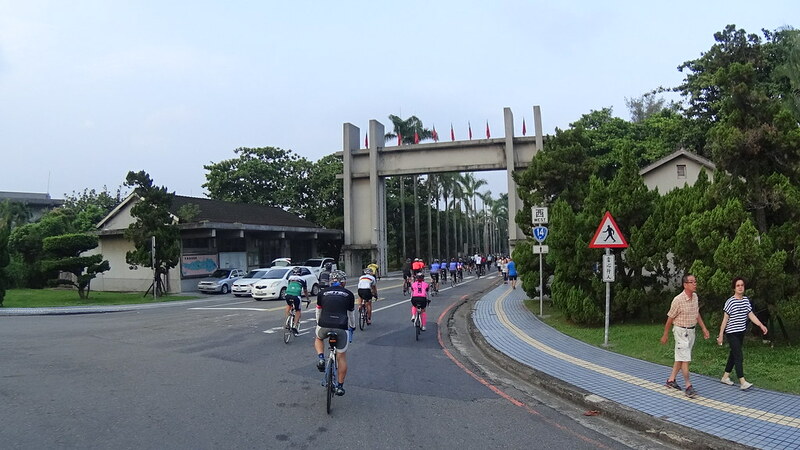 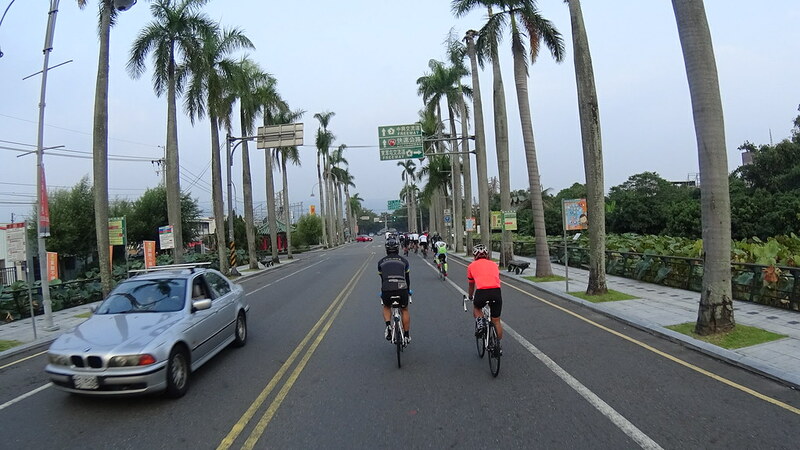 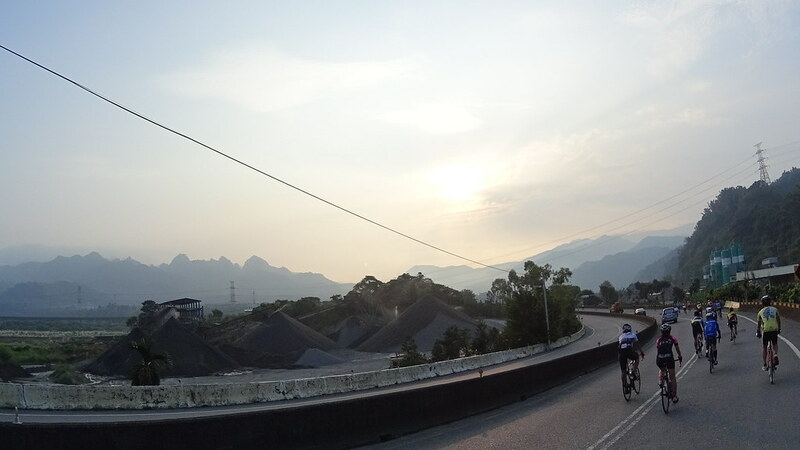 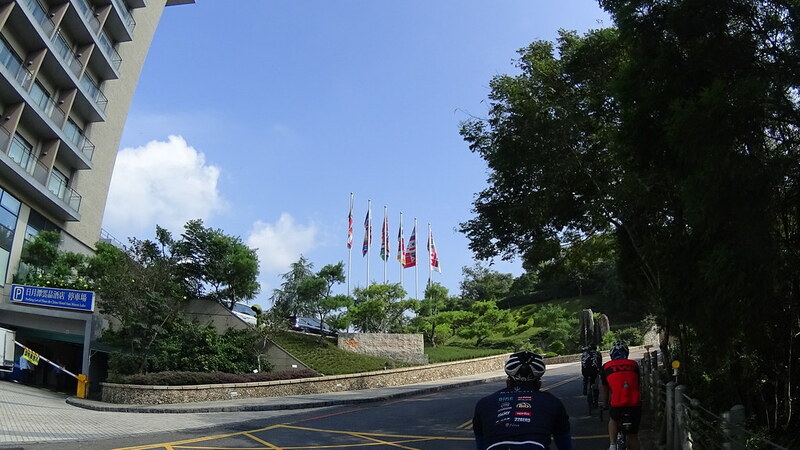 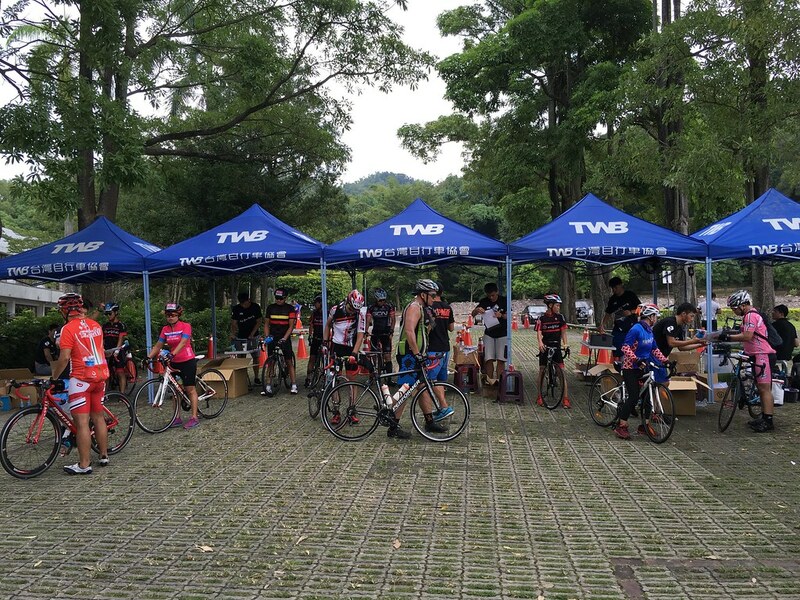 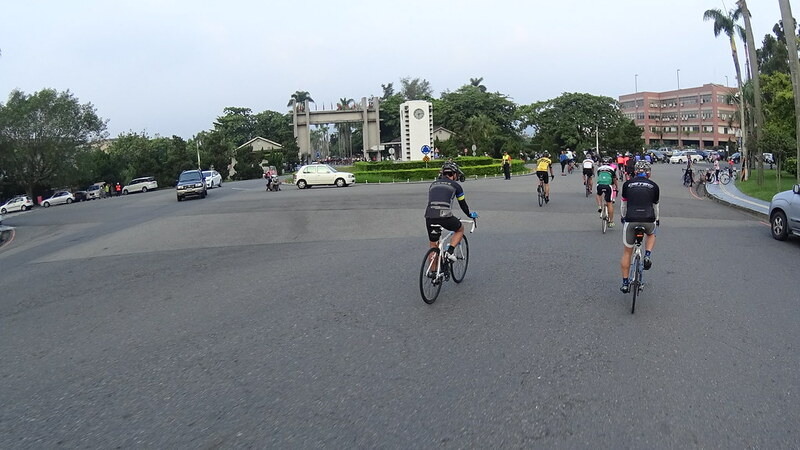 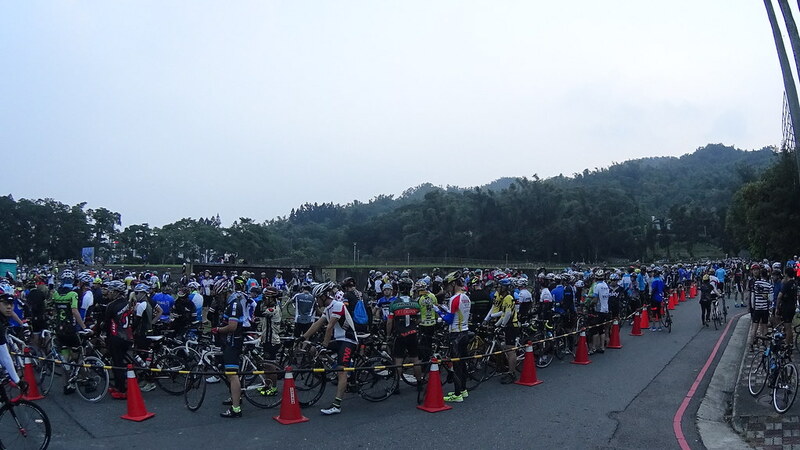 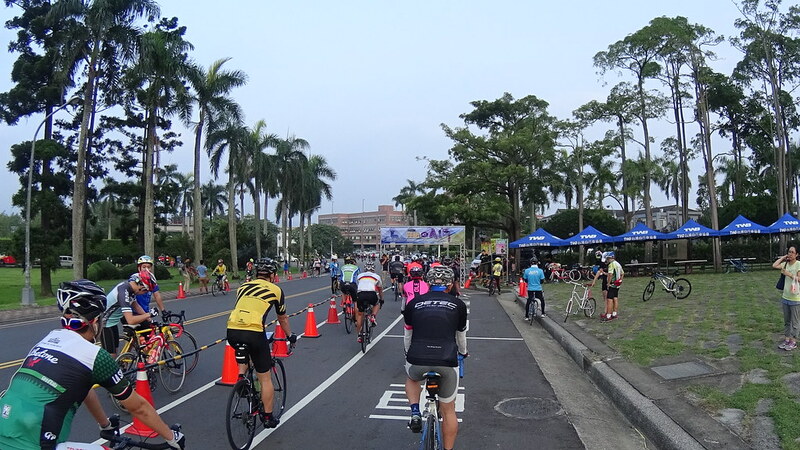 The route turn right onto Route #21 and starts heading towards the main site of this bike ride: the Sun Moon Lake. 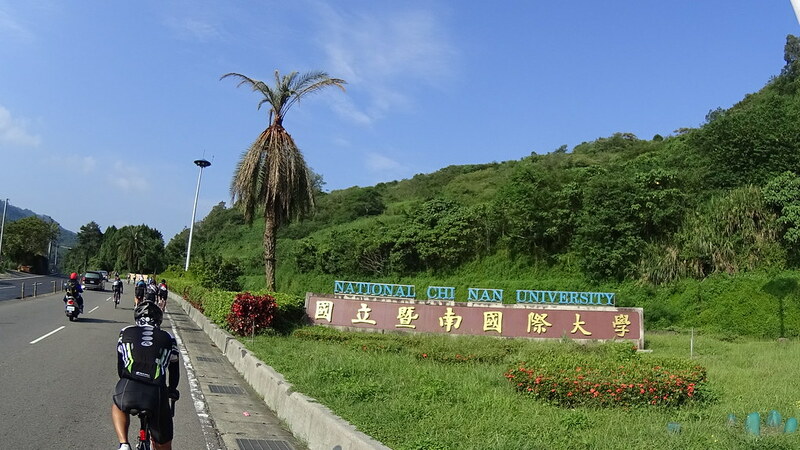 Chi Nan University entrance, the major university at Puli. 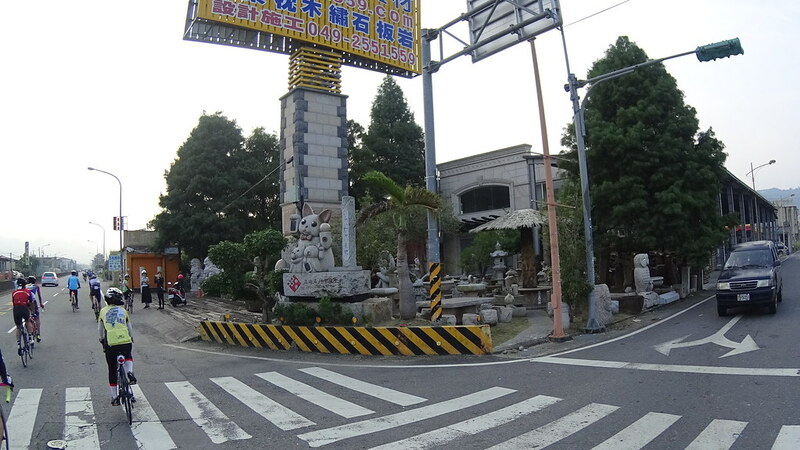 Originally I want to take a detour and visit a local “paper church” — a church made by paper. 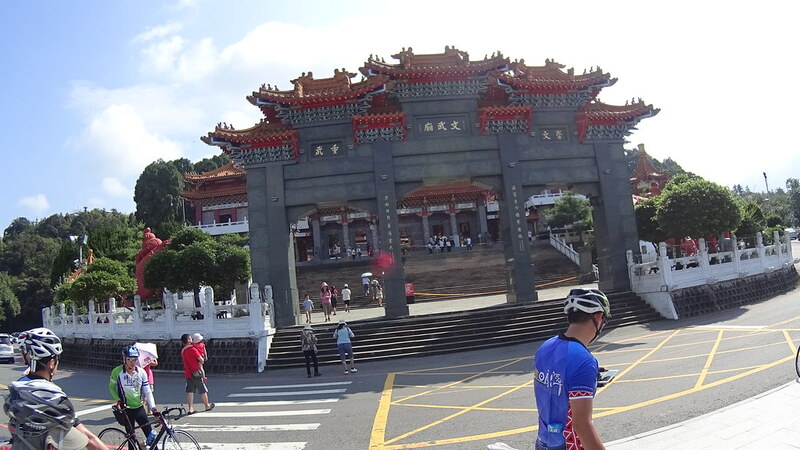 Unfortunately it only opens after 9am, and is not visible from outside of the gate. 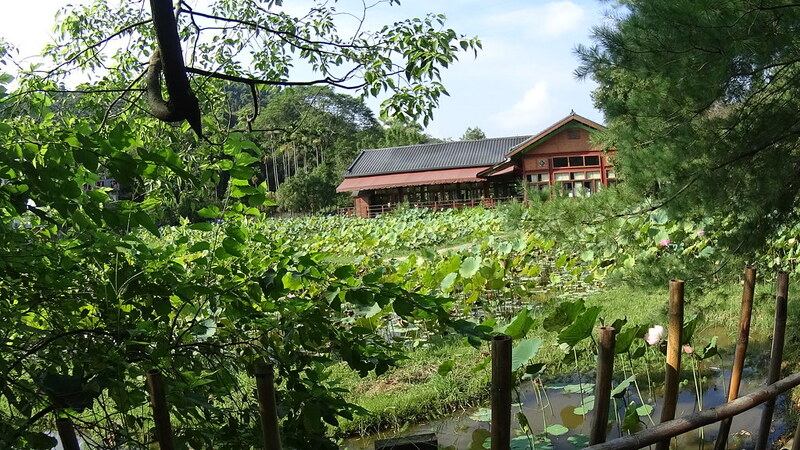 Lotus pond near the paper church. 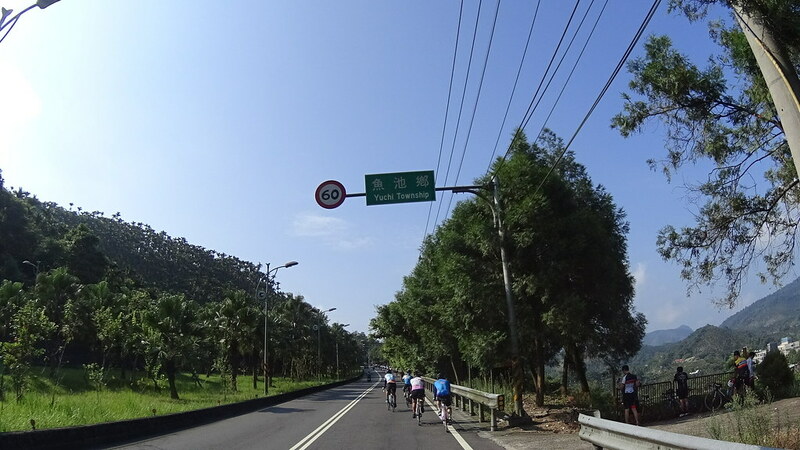 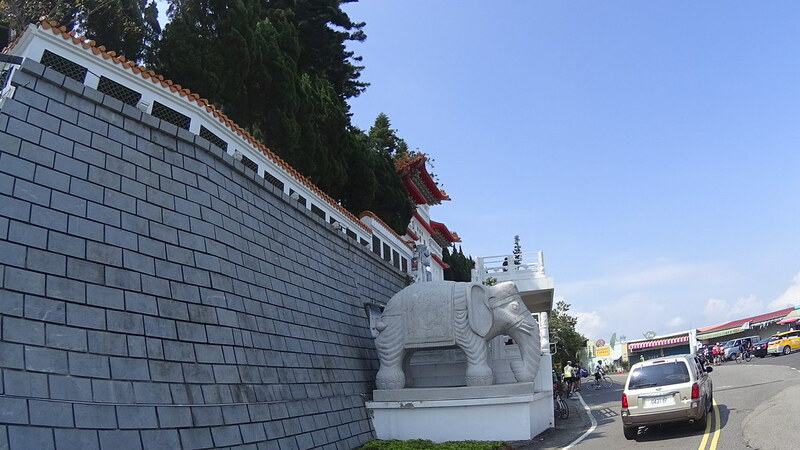 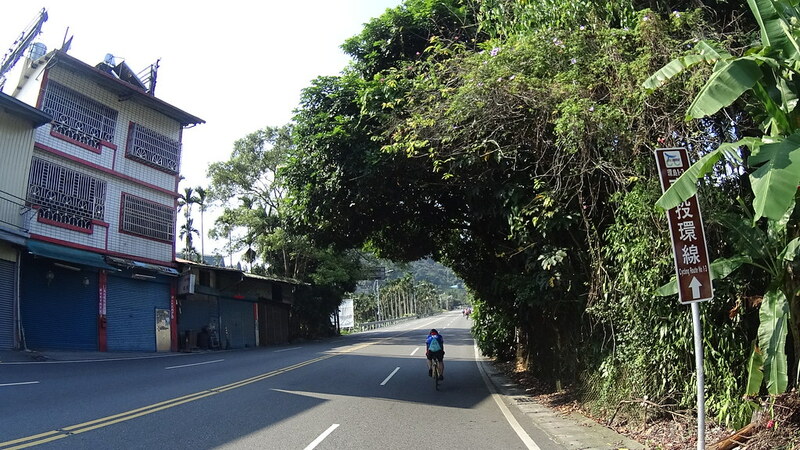 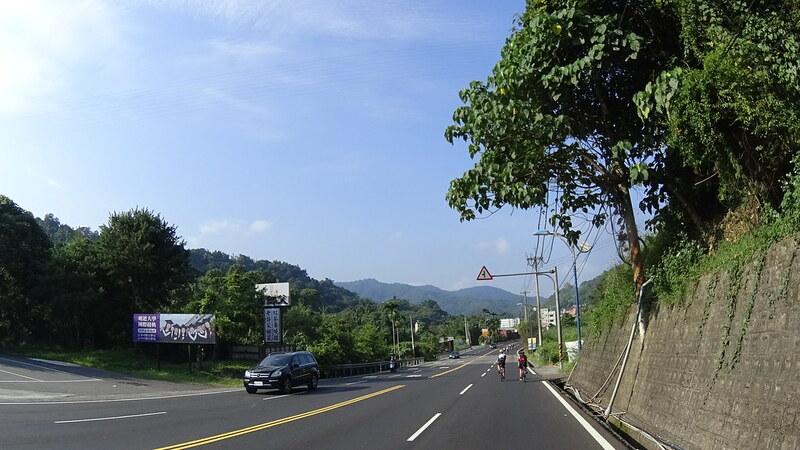 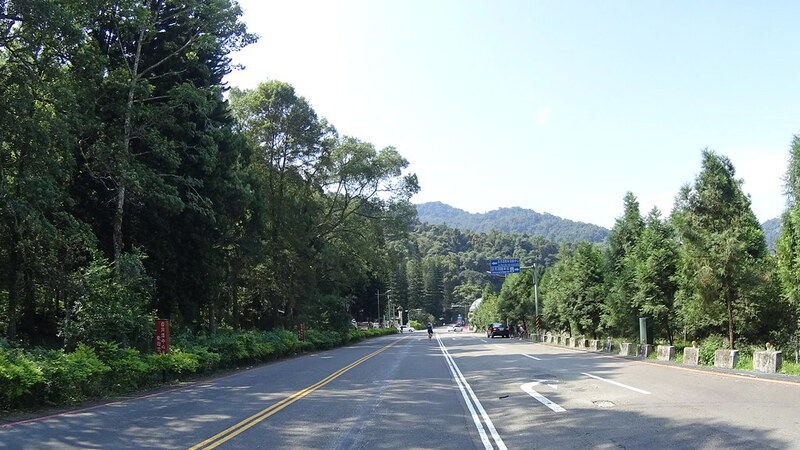 Route #21 is the beginning of long climb to the Sun Moon Lake. 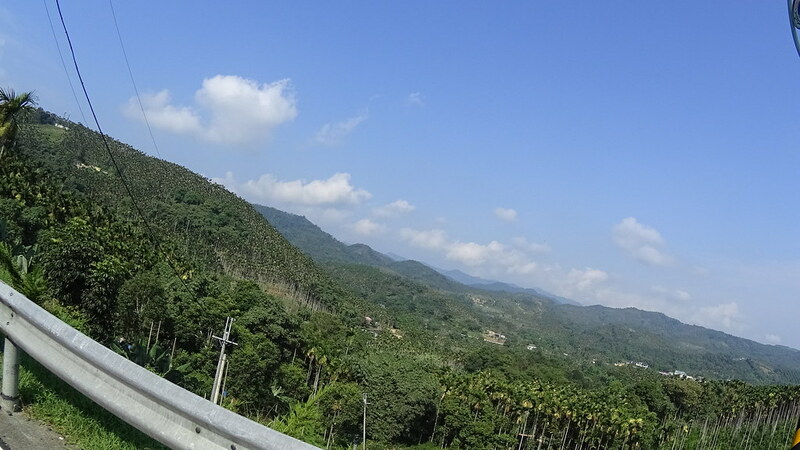 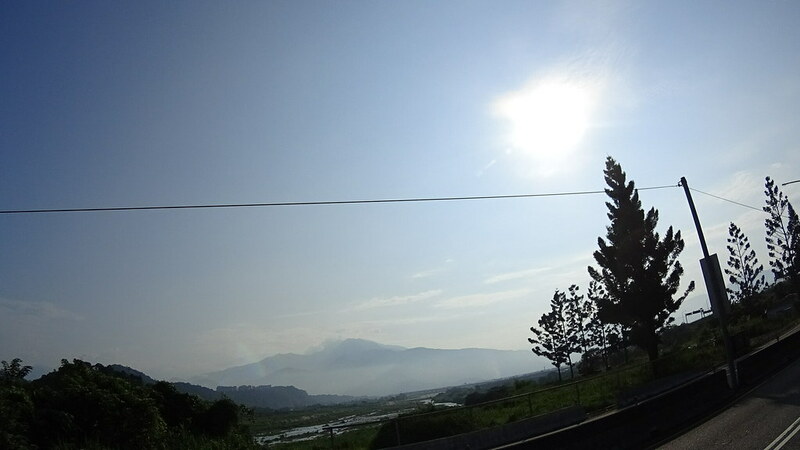 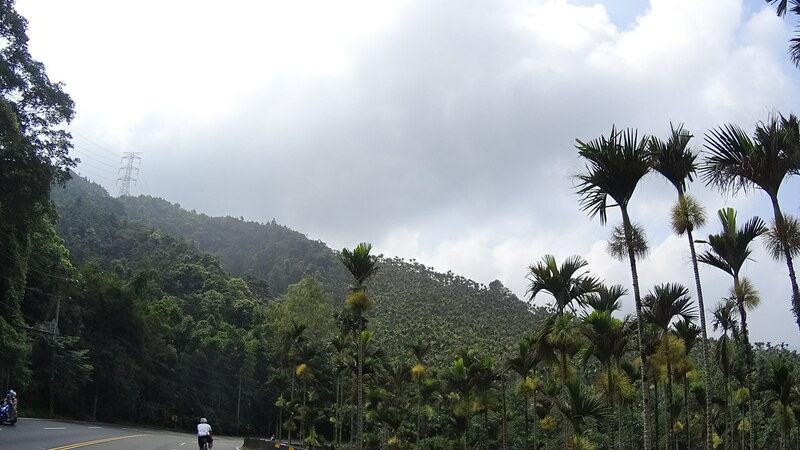 One sees typical hilly scenery of the Nantou county. 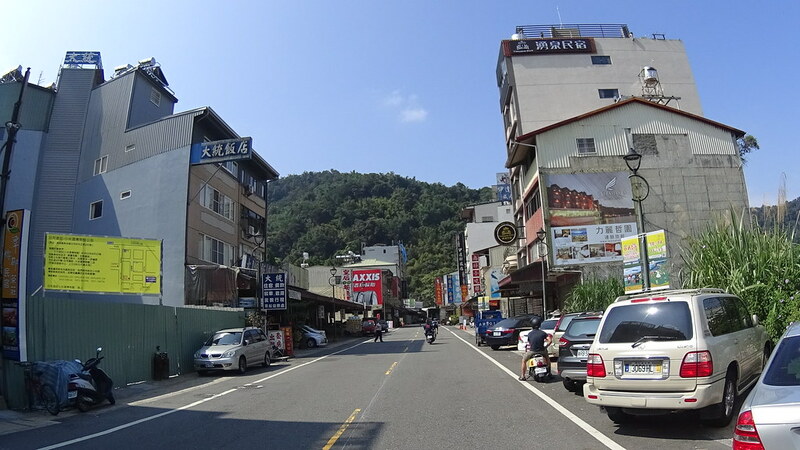 “YuChi Township”. 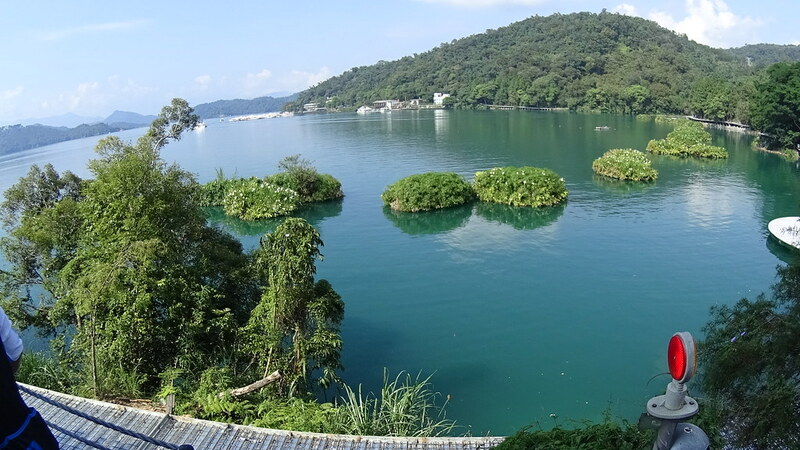 It literally means “Fish Ponds”. 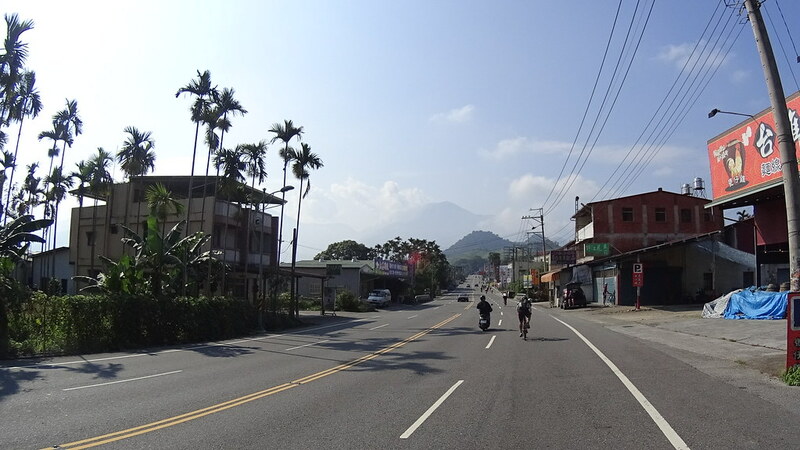 Notice the big mountain barely visible behind the mountain in front. 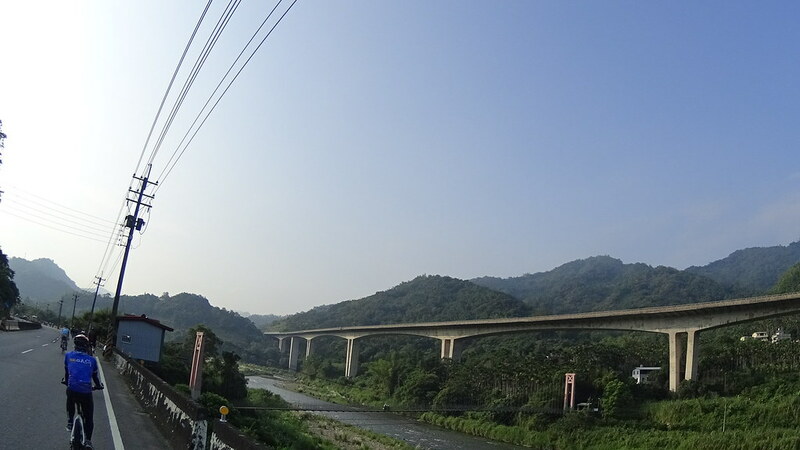 It looks almost two times higher. 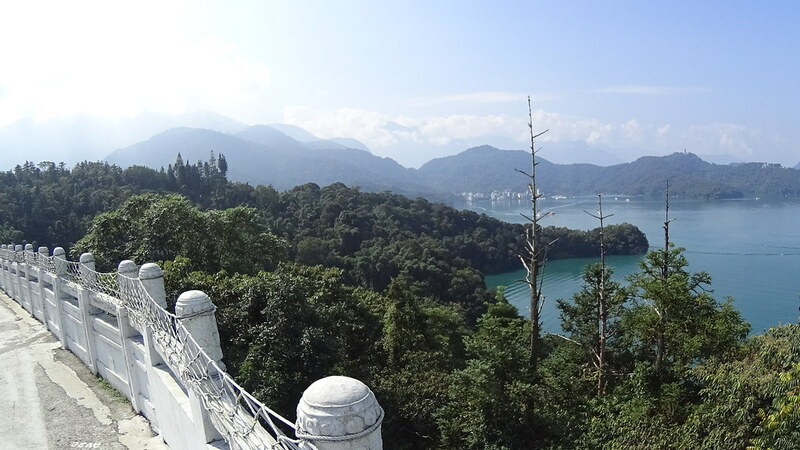 After some climbing we go over the hills and reach the Sun Moon Lake. 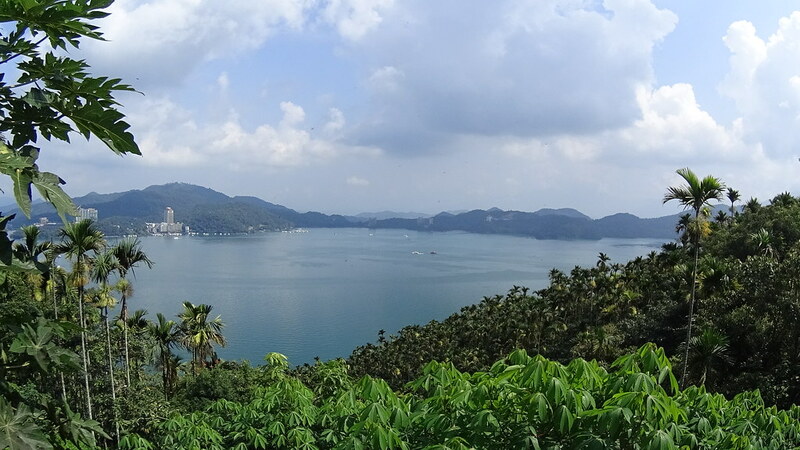 The Sun Moon Lake is the biggest natural lake in Taiwan. 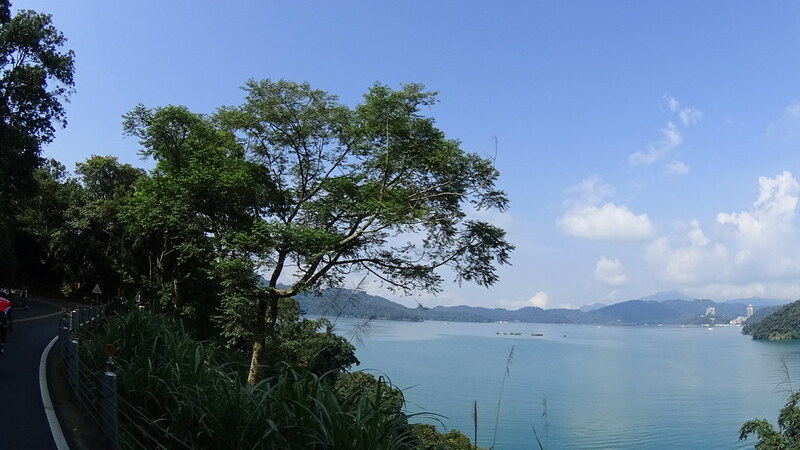 While it is definitely a beautiful lake, for years it suffer over-development due to over-promotion by the Taiwanese government, attracting many low-quality services and destroying the lake’s natural resources. 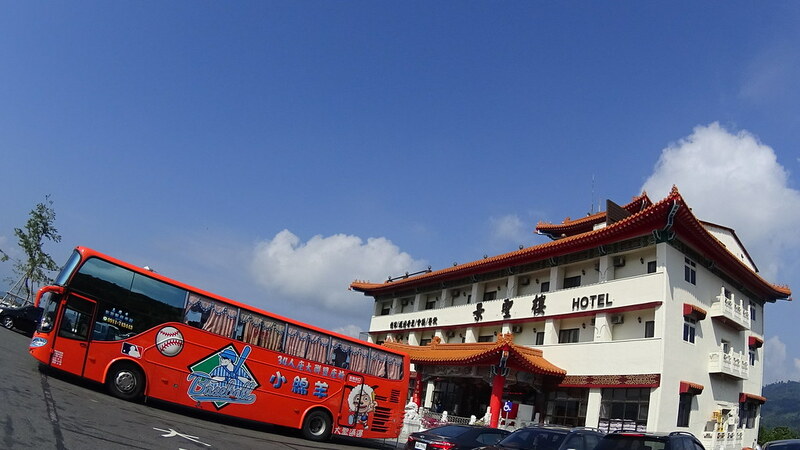 Recently there is a great reduction of tourists to Taiwan. 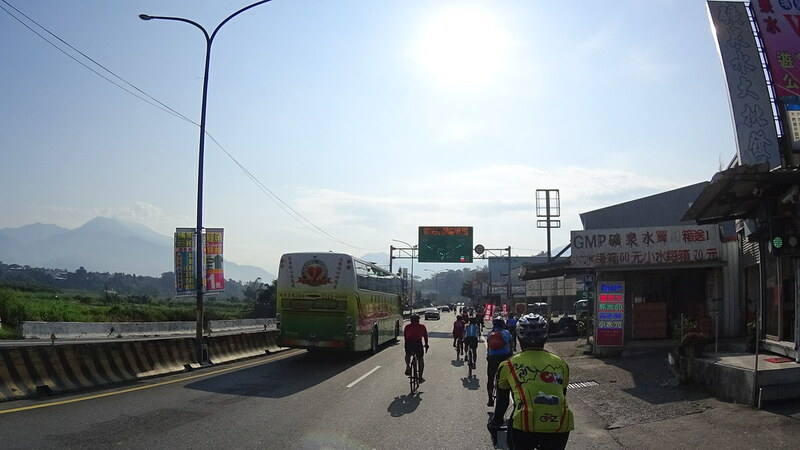 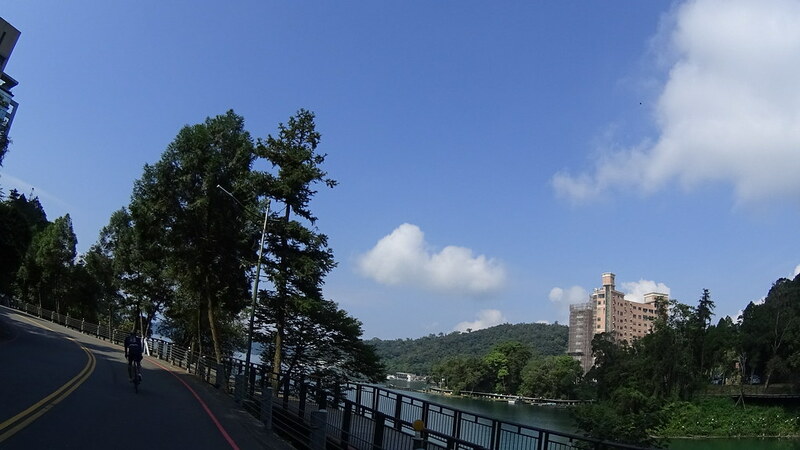 There are very few buses on the road, making cycling around Sun Moon Lake a very pleasant experience. 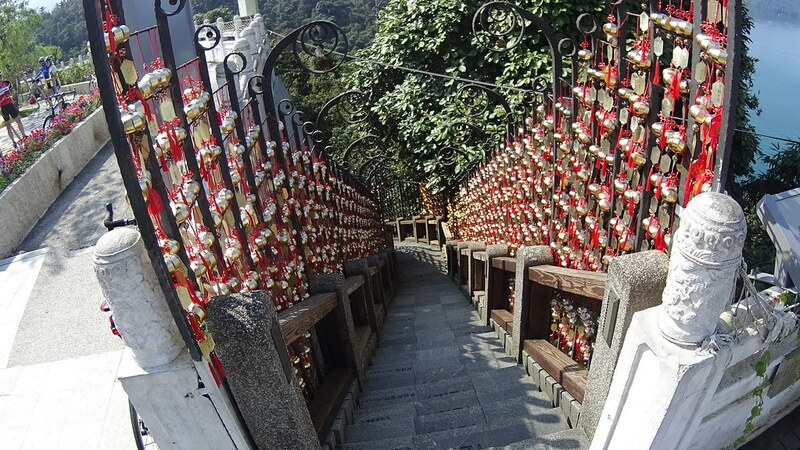 Stairs with tons of good-luck little signs. 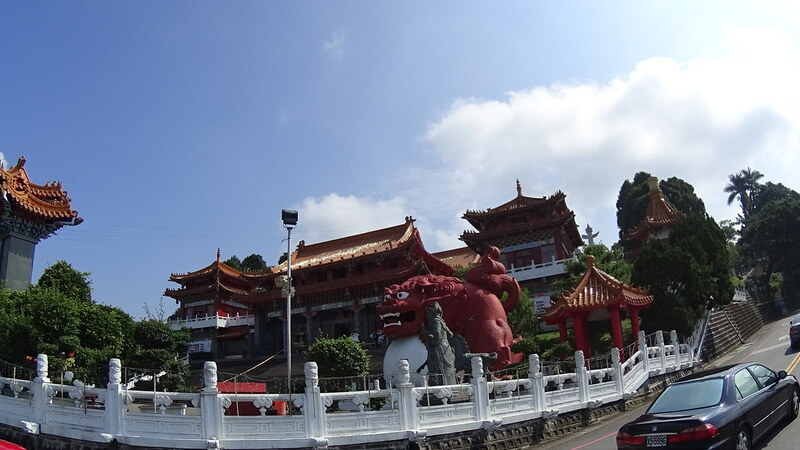 Closer look of the temple. 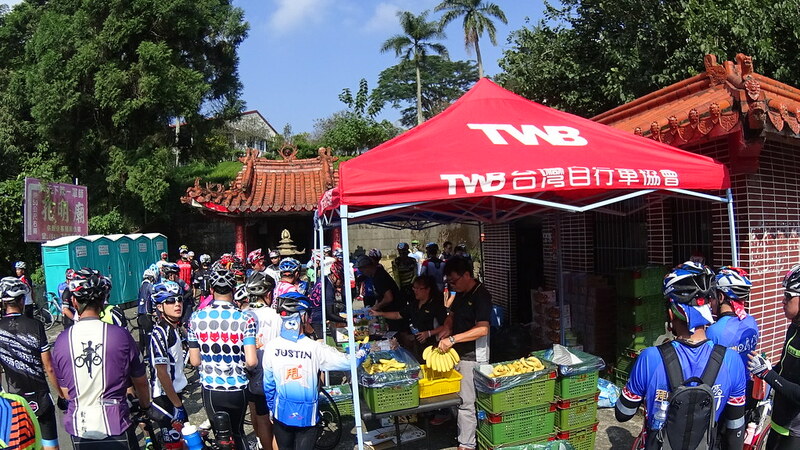 A common example of Taiwan government’s lack of taste and respect to aboriginal people. 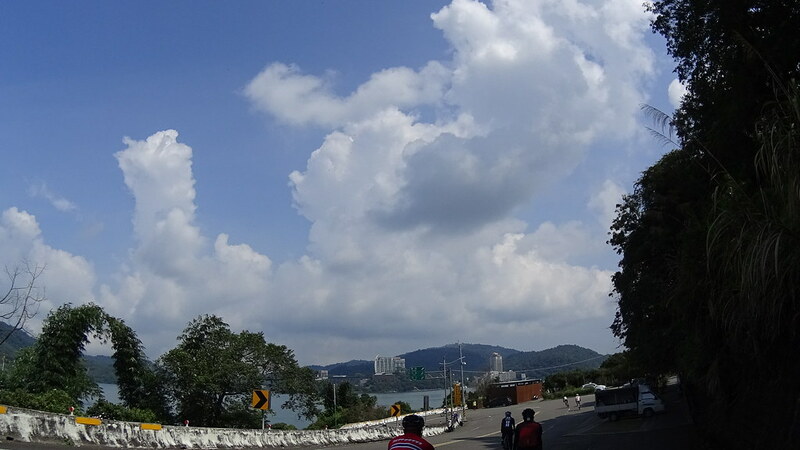 This supposes to represent an old aboriginal people living area. 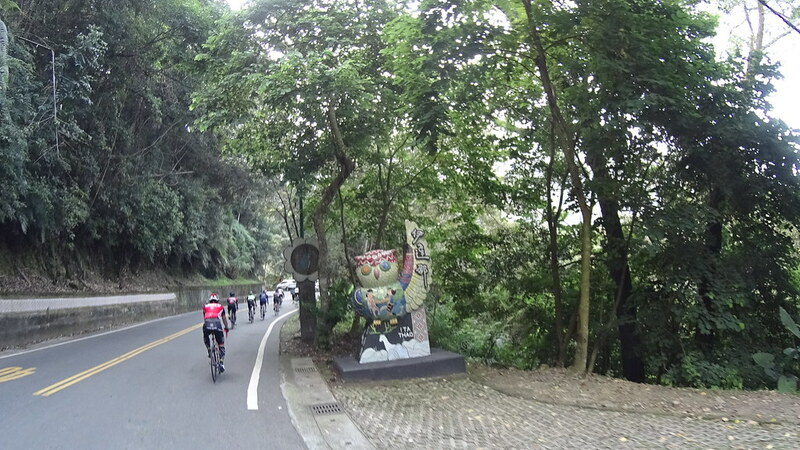 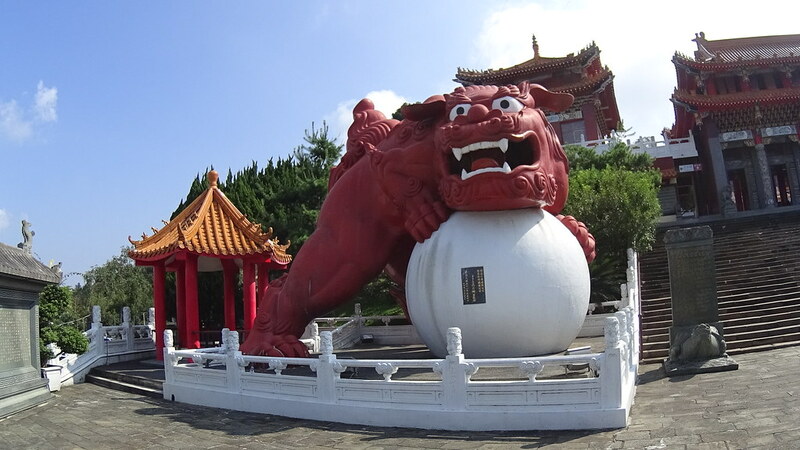 Instead of respect and dignity Taiwan government chooses this ridiculous “cute” statue for better attracting tourists. 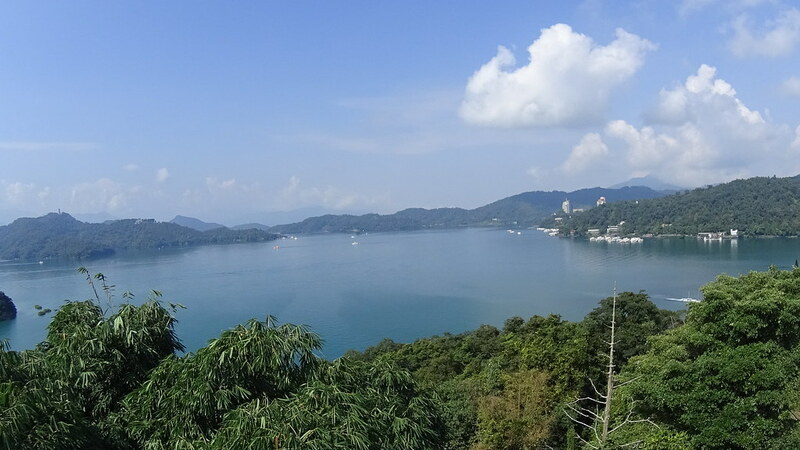 Yidashao, a small town at the side of Sun Moon Lake. 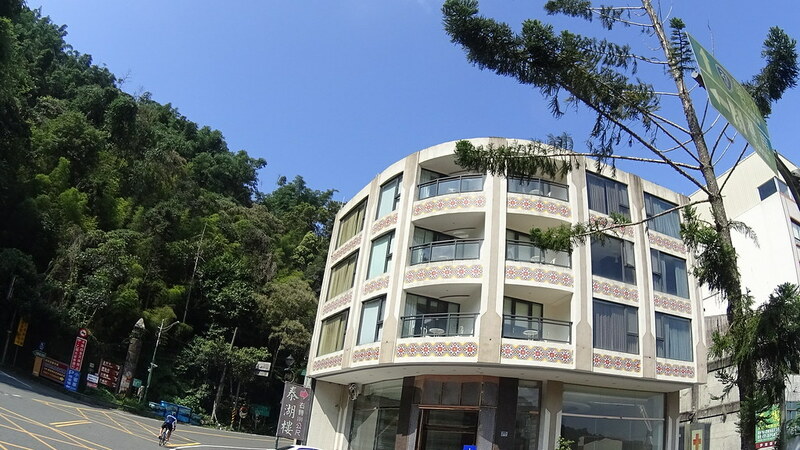 A hotel with aboriginal symbols. 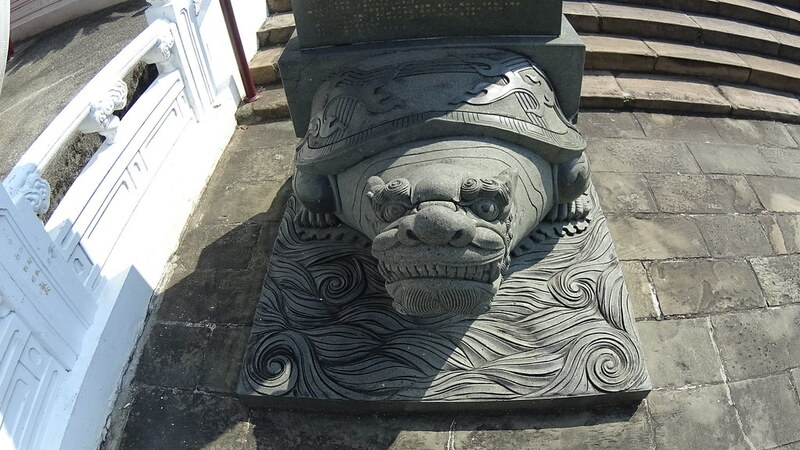 Sign of the Xuanzang Temple (玄奘寺). 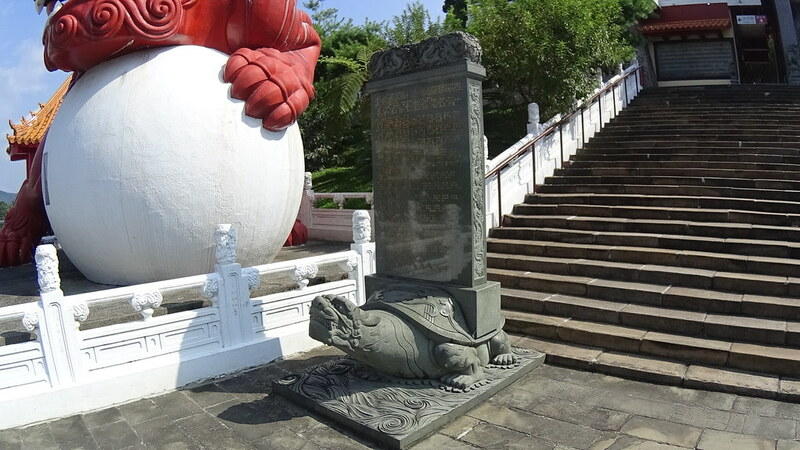 Tourism style Xuanzang Temple sign. 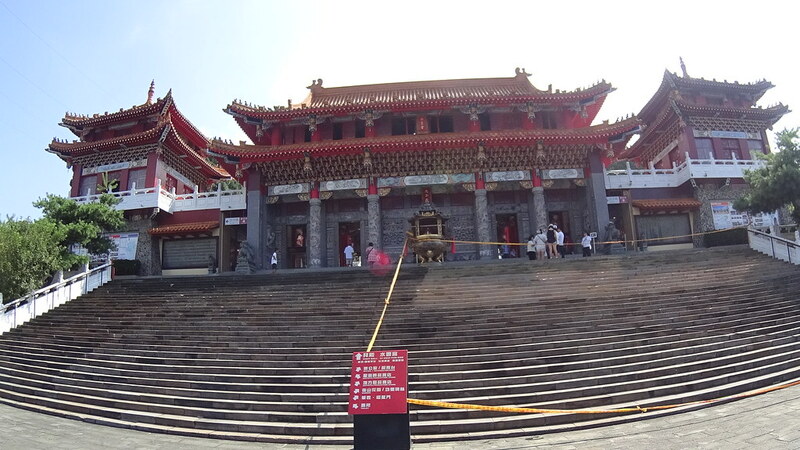 Xuanzang Temple main entrance. 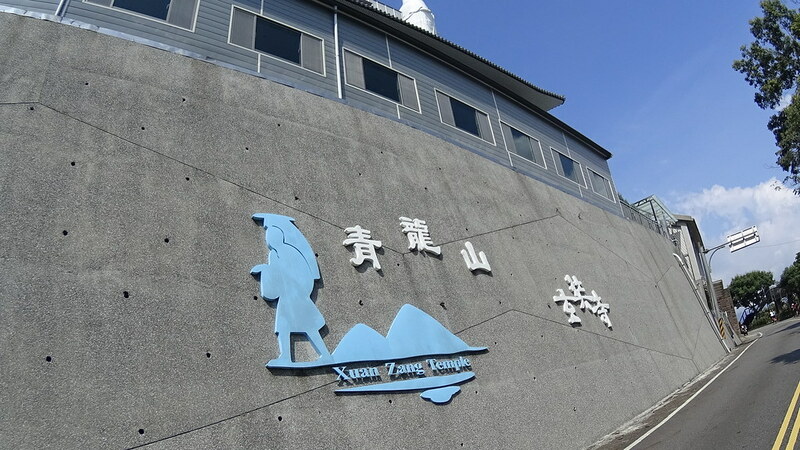 The chart depicts where Xuangzang has been to in Asia. 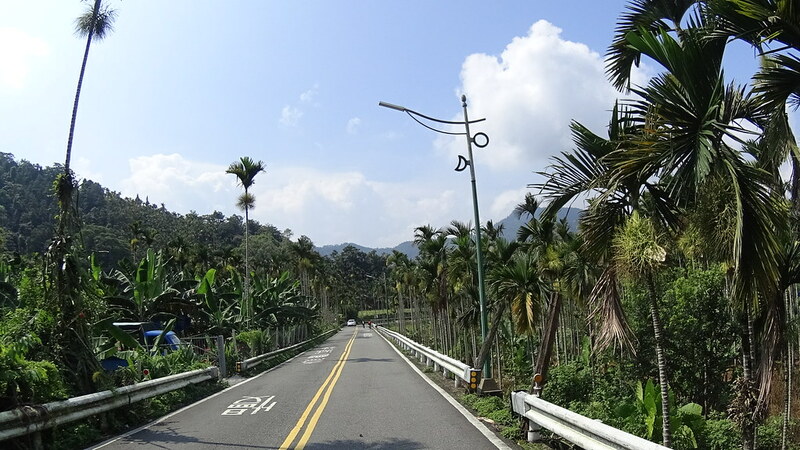 Route #21 eventually leaves Sun Moon Lake and heading south, passing a flat agricultural area filled with beetle nut trees. 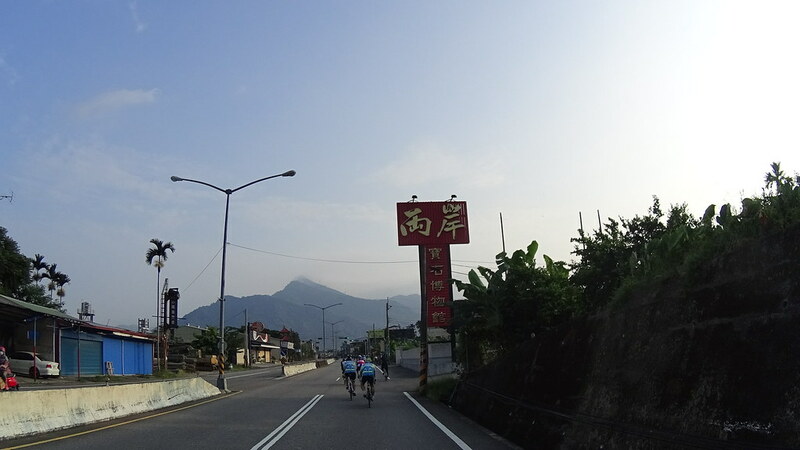 After descending from the mountain area the route enter Shuili Township (水里鄉). 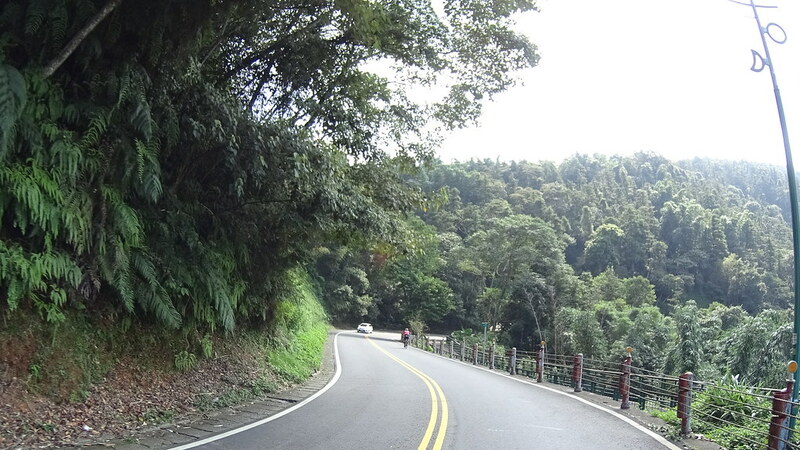 It is the beginning point of Route #21 that goes all the way to Tataka and the Jade Mountain. 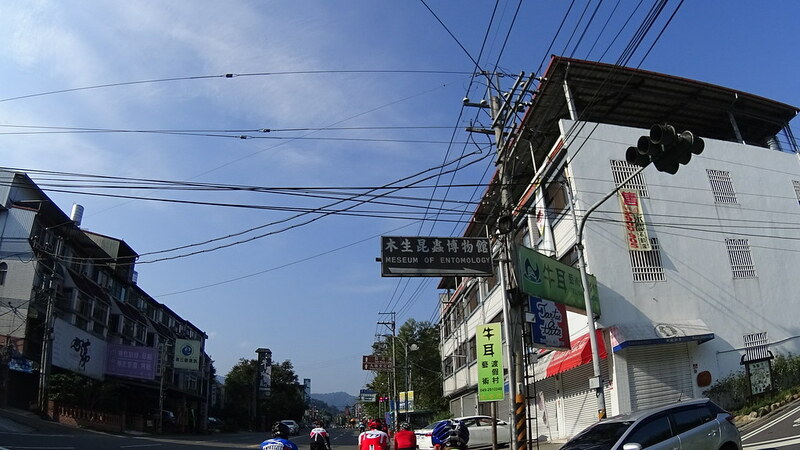 Shuili is also famous for its handmade pottery. 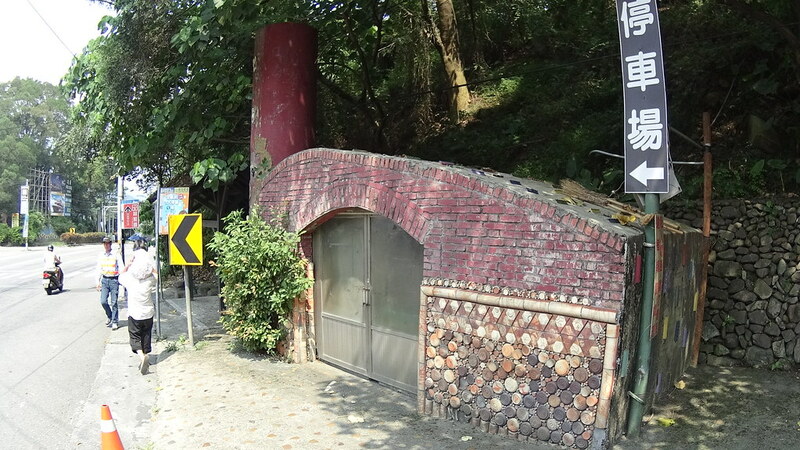 Due to the long length of pottery furnace it is called “the snake furnace (蛇窯)”. 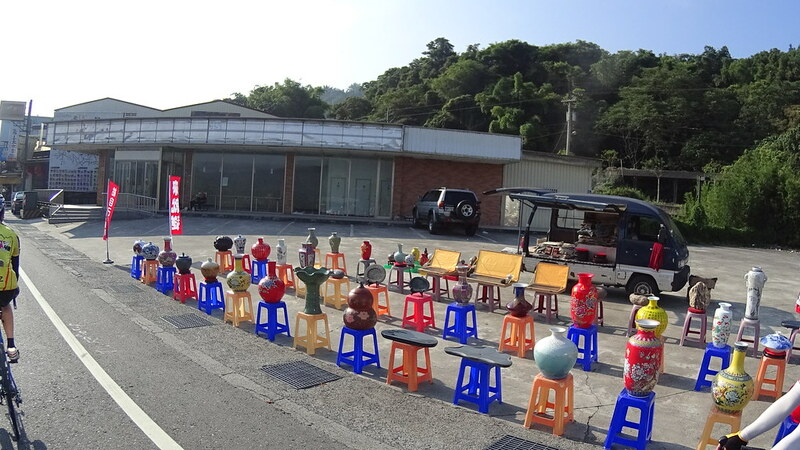 Pottery-made Shuili pottery area guide. 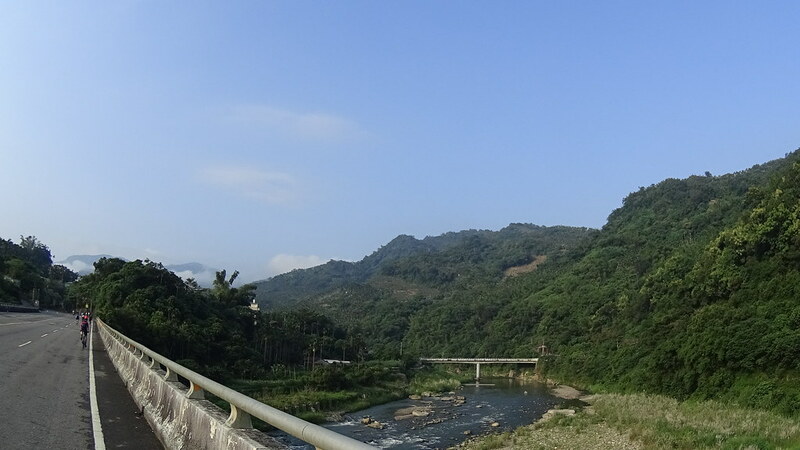 Crossing a river near Shuili. 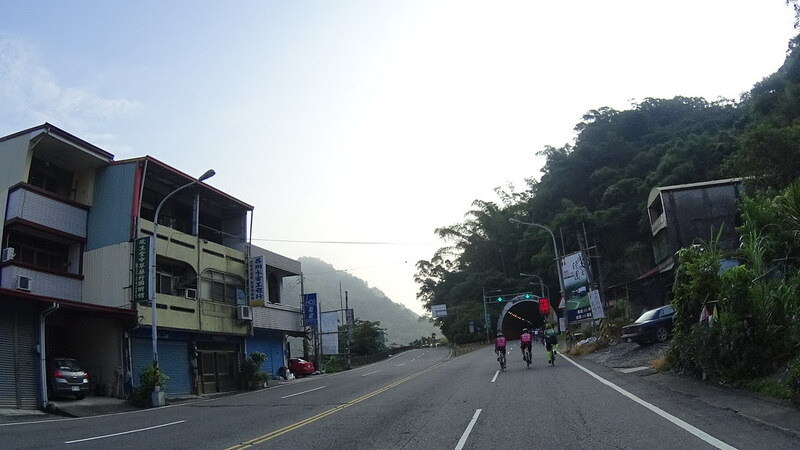 The route turns to Route #16 to head back to the starting point. 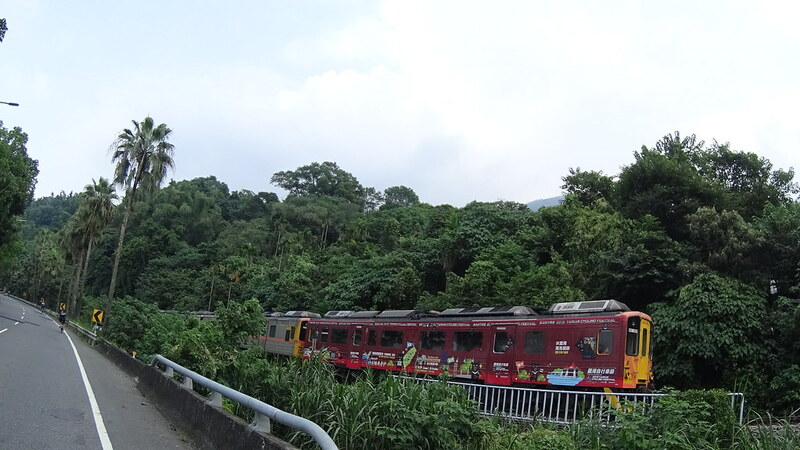 Along the way is a popular mountain train railway extension that goes from Nantou city to Checheng (車埕) east of Shuili. 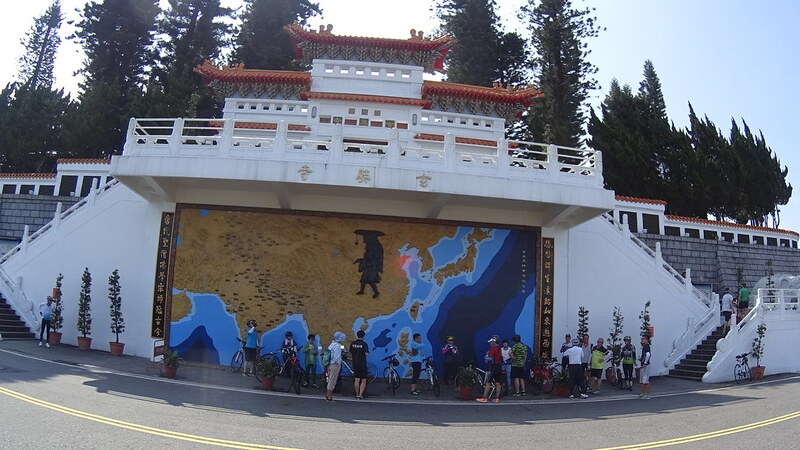 Painted “Taiwan Bike Festival” theme train. 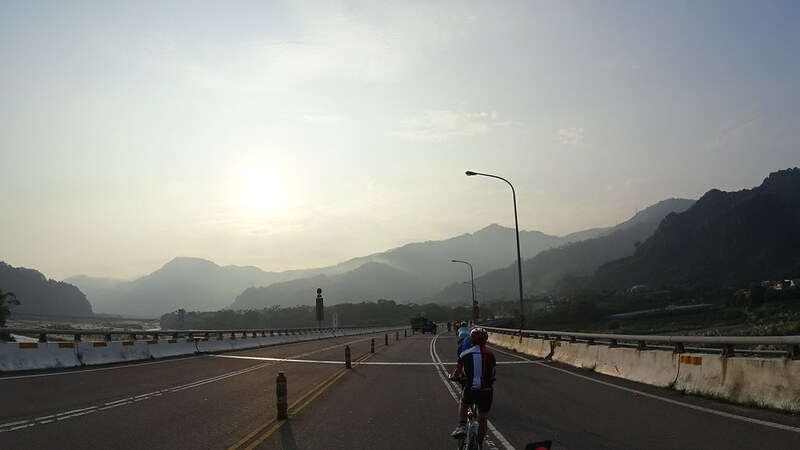 Like Route #14, Route #16 has amazing wide river-valley scenery. 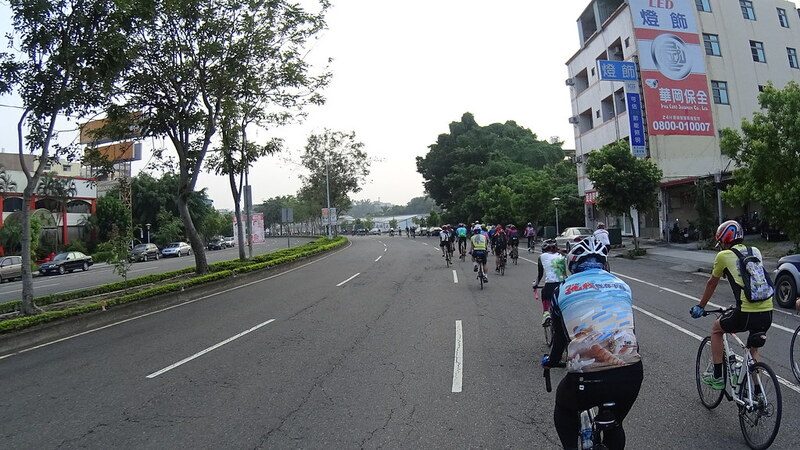 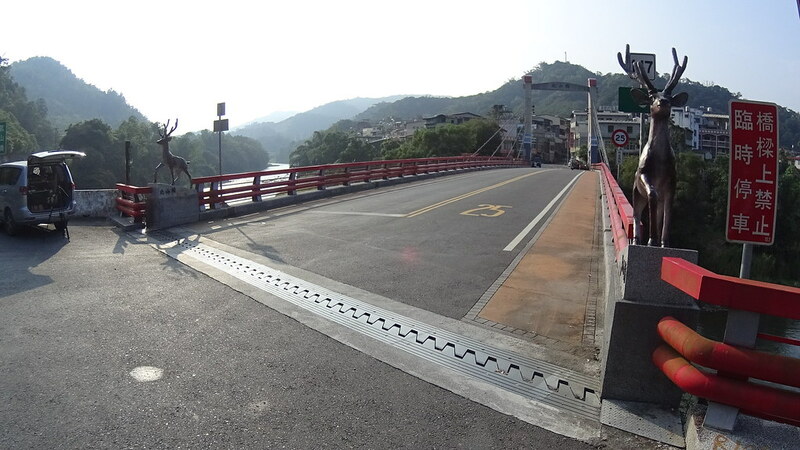 Eventually the route re-enters crowded Nantou City and back to Zhongxing New Village. 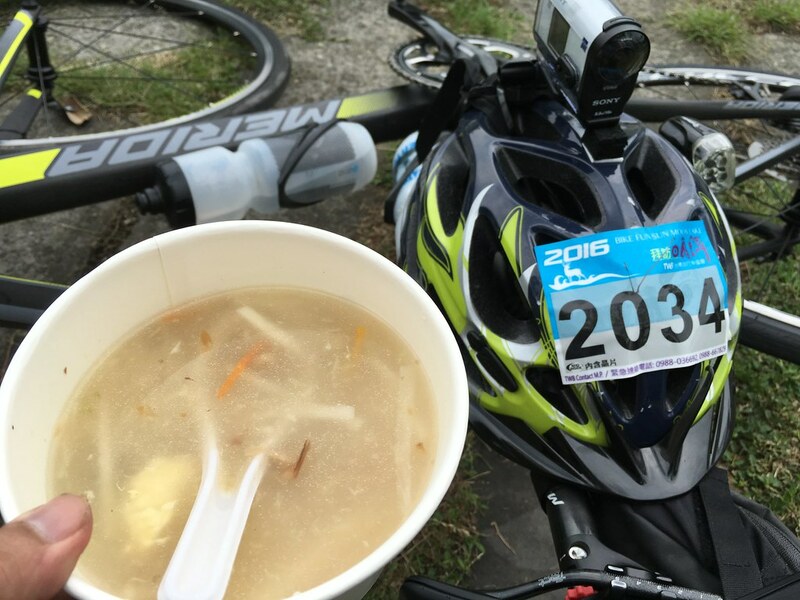 Delicious congee awaits for hungry cyclists. 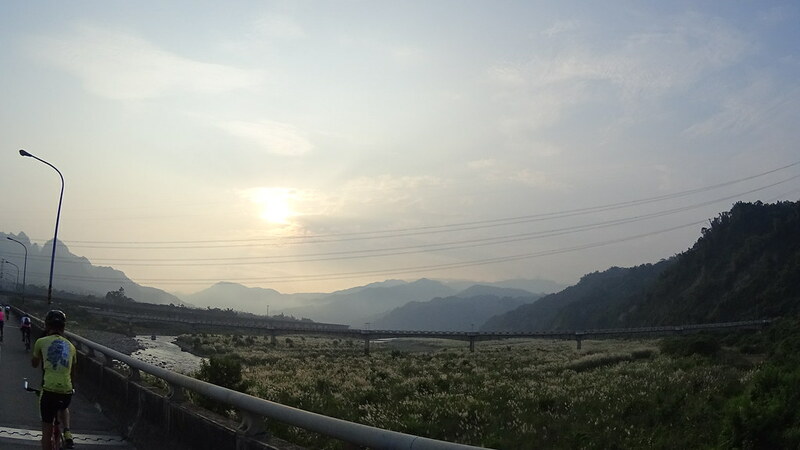 Taiwan-style congee. 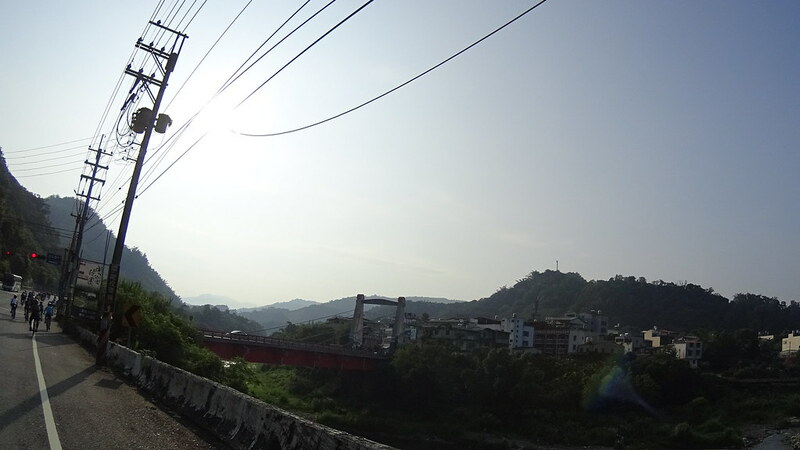 It differs from Cantonese congee commonly seen in US Chinatown by that the soup is not creamy, and the rice are still distinguishable from each other.